1970 was an auspicious year – it opened new vistas for Thelma and me. It also closed some chapters in our lives. 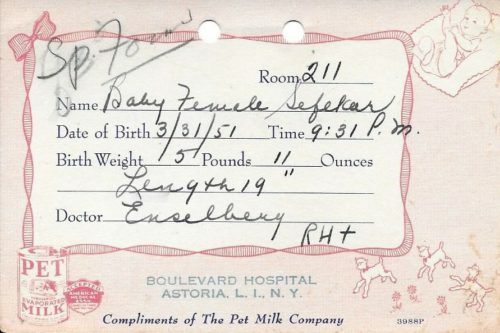 On Saturday, January 10, 1970, Thelma’s mother, Bessie Lakoff died at the age of 85. 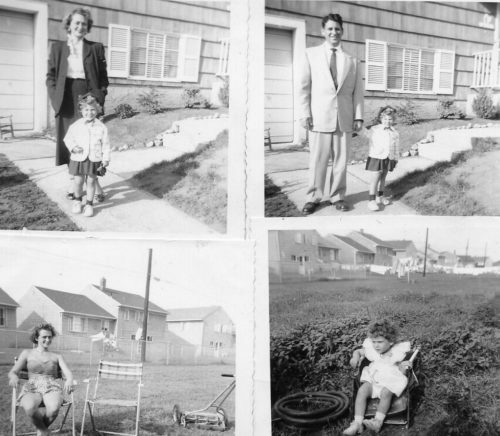 Her life had been difficult, as most immigrant families had experienced. She had migrated from Vilna, Russia – her husband, William had preceded her to the new country where they raised a family of 4 daughters and one son. A happily married life but had become a widow when William died in November 1939. My son William Charles would be named after him. 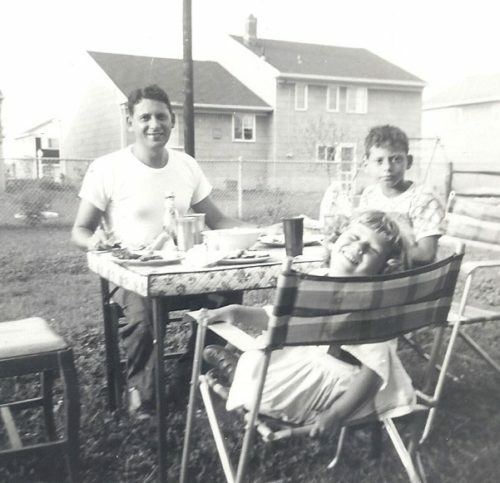 It was a financial struggle raising a family during the aftermath of the depression. But it was a close family and the siblings helped support their mother. 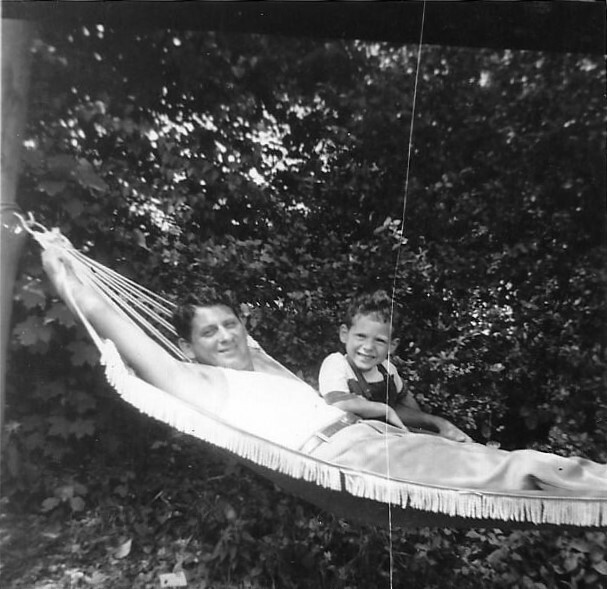 Jack and Jenny (Pop and Mom) were always there for us. No lengthy heart to heart talks, but daily concern over our well-being. It was like they were on the side lines – guiding our way through the calm and the eddies. We had the usual admonishments of “yes” and “no”, but all I remember were the decisions that I had to make for myself but can remember none that my siblings made for themselves. 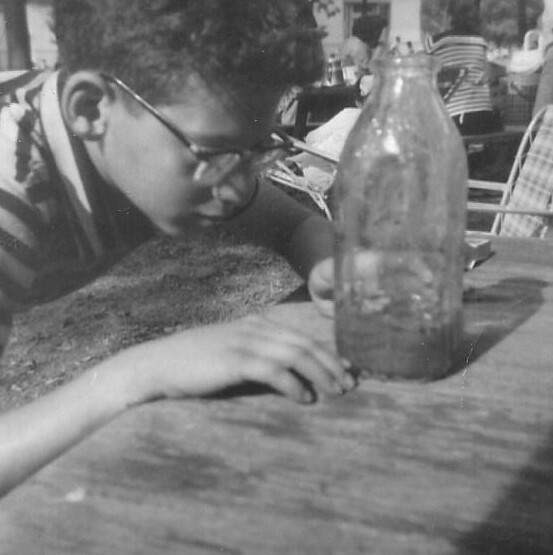 In our immigrant family, this was how personal independence was instilled in the children. But we were content. And that is why we were able to let them go, as they slipped out of our lives. 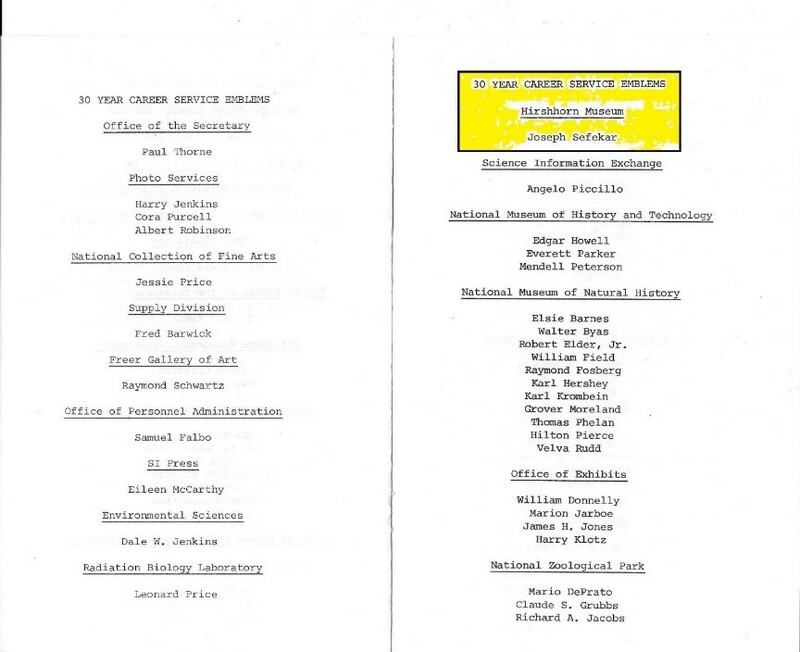 Pop died the week that I started my new job with the Smithsonian. Added to the trauma of losing a parent was the uncertainties associated with the starting of a new job – in this case it was an ending and a beginning. 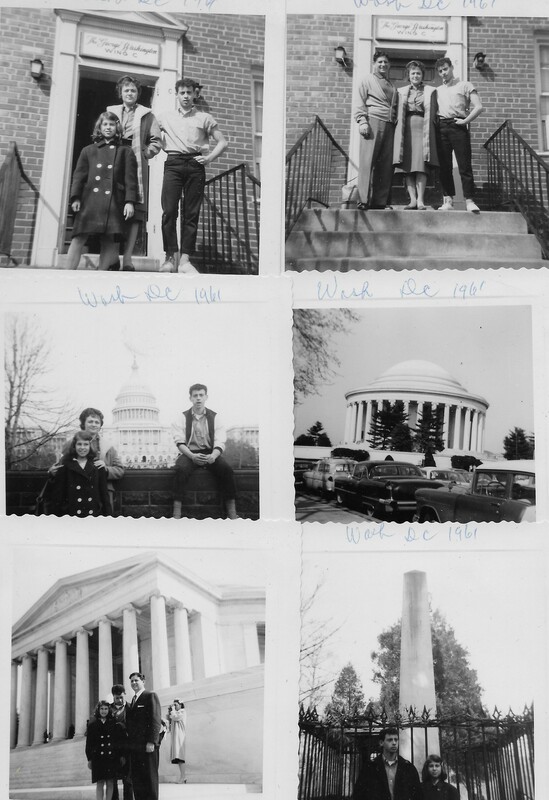 My wife and children lived in Washington, D.C. 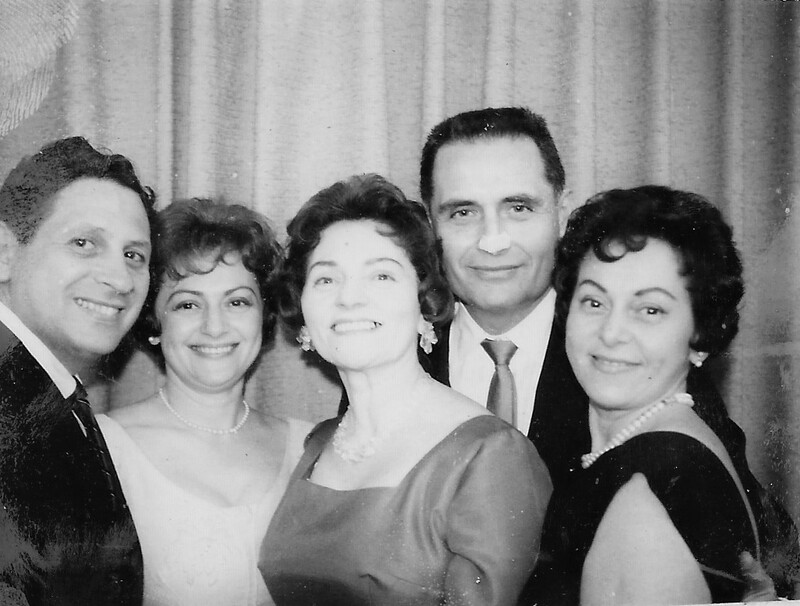 When Pop died, my brother Al and my sisters, who lived in New York attended to the funeral arrangements. 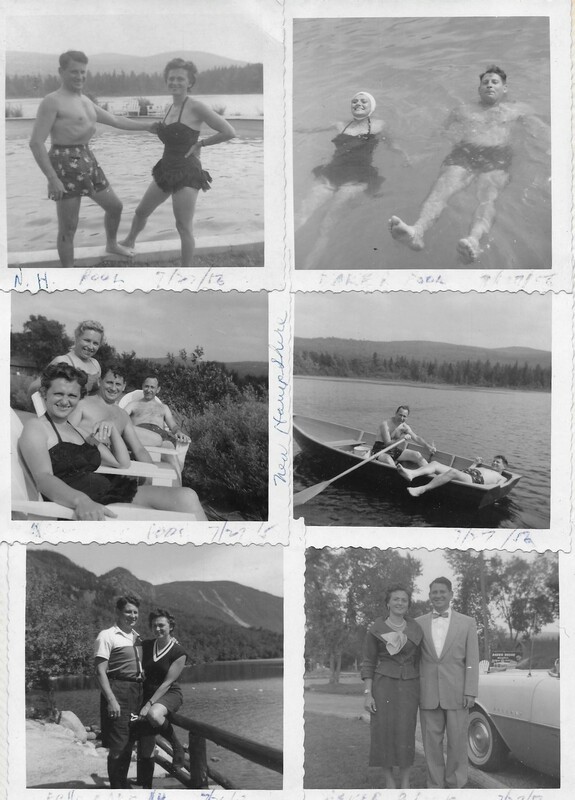 My sister, Lucy, lived in Toronto, Canada, with her husband Hy and two children, Gloria and Martin. They were family oriented, although they were a distance away. They kept in close touch with us. Lucy was the oldest, and kept us together with her energy and concern. Starting a new job, I had trepidations of the effect on my new assignment and my absence due to family problems. But since everything, at this point was in the planning stages I will become part of the start-up operations. Actually, although the period of mourning in the Jewish religion is seven days, there is a mini period of three days to accommodate the exigencies of the 20th century. Normally, internment is one or two days after the passing of the deceased. With the mourning period behind us, I was able to concentrate on the new job and to try to spend some quality time with Thelma and the kids. 1) My subletting an apartment in New York, which would make the prospect of a two-year separation, seems more difficult to endure. 2) Have my wife join me and we would stay with her widowed sister, Yetta Starr. This was not practicable inasmuch as we had two children going to school or living in Washington. This would disrupt my wife’s social activities for 2 years and possibly longer, if construction were delayed. “If you have to fire them, can you do it? “Yes. But in the Federal Civil Service, you can’t dismiss an employee without following regular grievance procedures”. That seemed to satisfy him and the interviewed ended. It was a strange discussion because I would be the only individual on the entire staff of 10 that enjoyed prior Civil Service longevity. 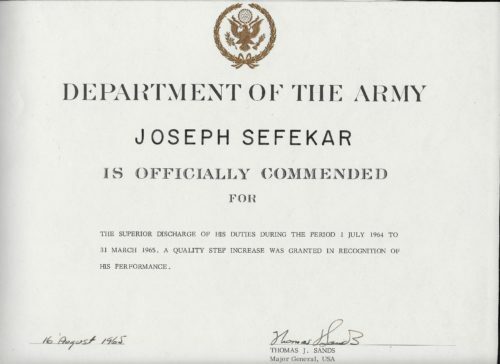 It was this Federal status, my knowledge of personnel procedures, familiarity with the obligation of controlled funds that gave me the edge in being selected. Another thing that helped was my extensive experience in preparing and executing a financial plan that could project our requirements for the next five years. 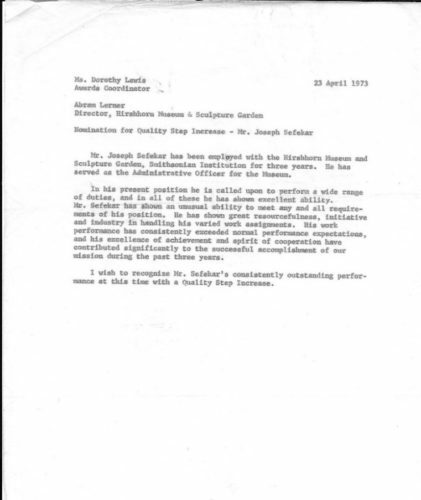 Other factors were my extensive experience in purchasing supplies, equipment and services. 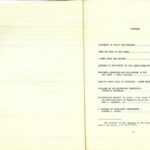 We had to find justification for purchasing white Formica desks and file cabinets, and library shelving when government regulations required colors of olive green be regular issue? The staff had previously submitted the required Civil Service Application Form 72, and based on qualification requirements were accepted for positions commensurate with their education and experience. 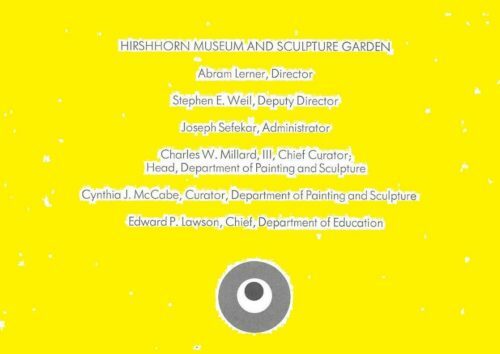 This small cadre was comprised of working curators, art historians, and art handlers with Undergraduate and Master degrees in their fields of specialty. 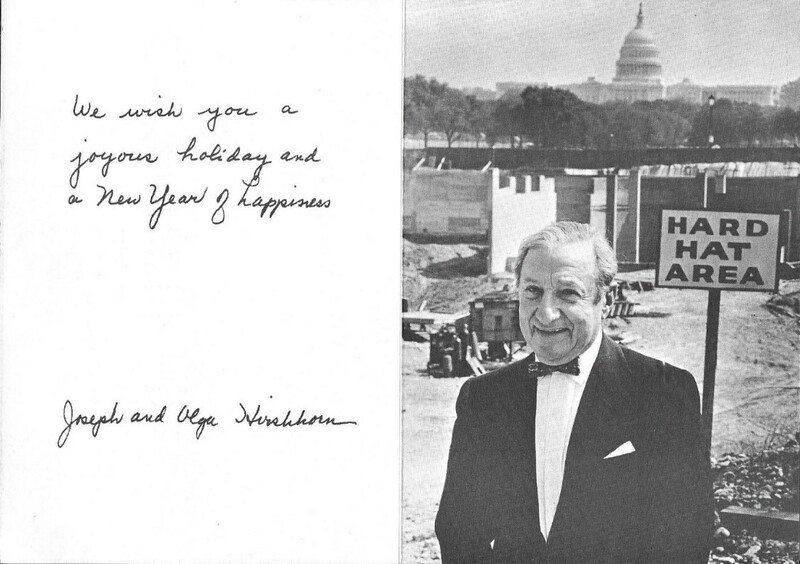 They were a young, enthusiastic and loyal group, and Mr. Hirshhorn was our Patriarch. I had taken some related art subjects in my undergraduate studies – but nothing very deep and the one thing that stayed with me – were the classical Greek columns: Corinthian, Doric and Ionian. 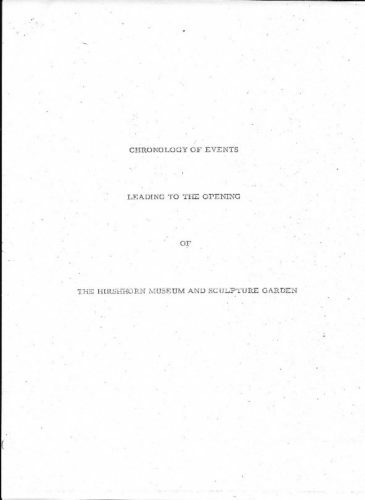 My initial exposure to modern art was a book by Milton W. Brown “The Story of the Armory Show,” [The Joseph H. Hirshhorn Foundation – Library of Congress Catalog No. 63-13496.) 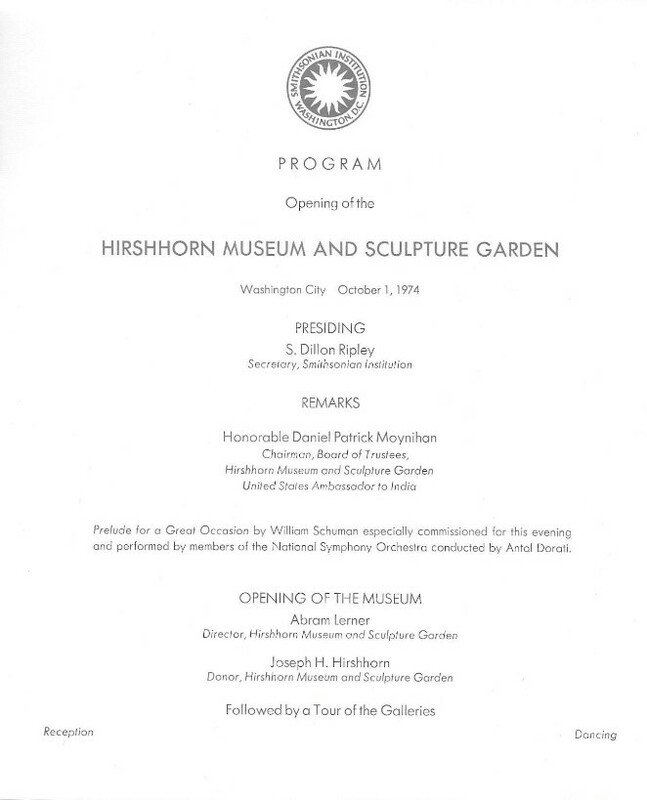 The author had done a treatise for Mr. Hirshhorn, which was a historical account of the Armory Show of 1913, (**show picture to appear in manuscript) reassembling the show and relying on documents created by a small group of artists banding together as the Association of American Painters and Sculptors. Being a nostalgia buff, what intrigued me was that this show debuted February 17, 1913, and was for a whole generation of artists the introduction to Modern Art, which slowly crept into the American psyche. Being a Management Analyst qualifies one for any field, similar to being a stenographer, where having experience in a field is not a prerequisite to being hired. I was able to continue, into the maze of daily challenges, which included adjusting to the personal lives of the staff. 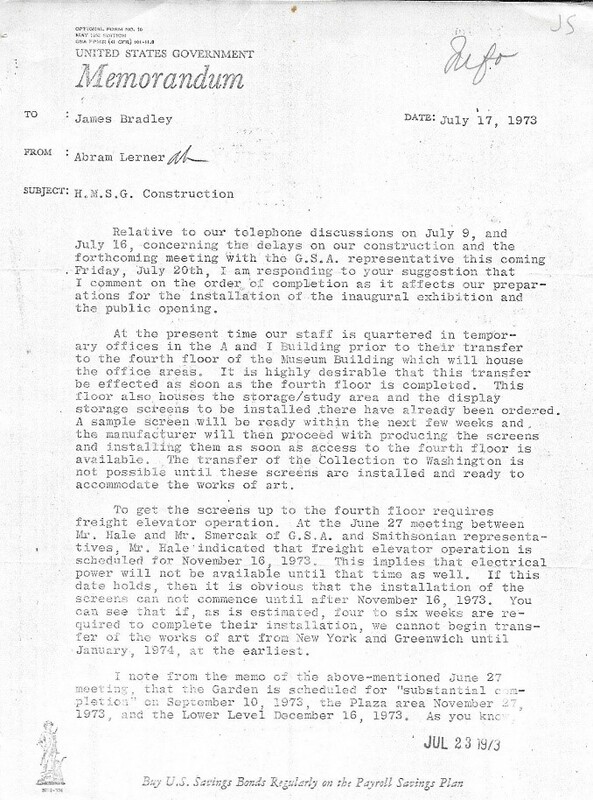 The Abram Lerner, Director of the Museum had a chronic back disorder which required constant medical supervision, and at times was hospitalized because of pain and discomfort. But he still was on the job and was always available. Having been Hirshhorn’s personal curator for many years, it was only natural that the Smithsonian selected him to be the Director of the new Museum. 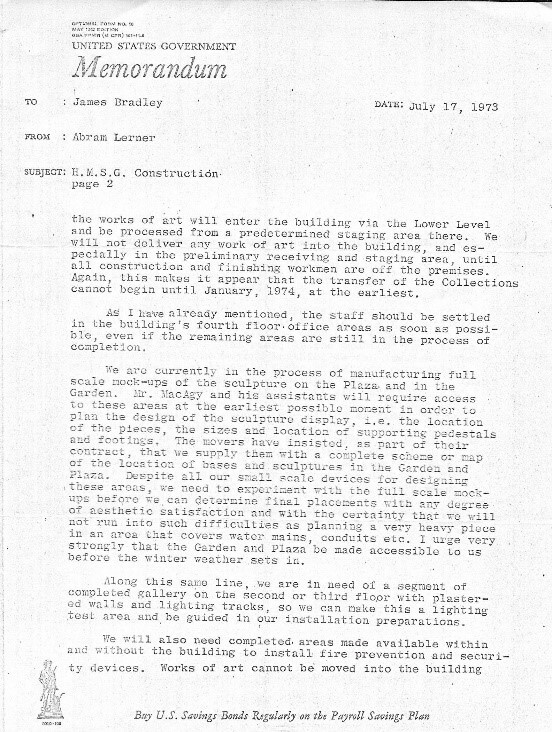 Mr. Lerner deftly brought together each part of the museum into one integrated and smoothly operating entity. He appreciated the fact that I was a neophyte in the realm of art. He was patient with me and his guidance was like a helping hand rather than that of the teacher. The staff was involved in different art related areas, and I worked with them daily. 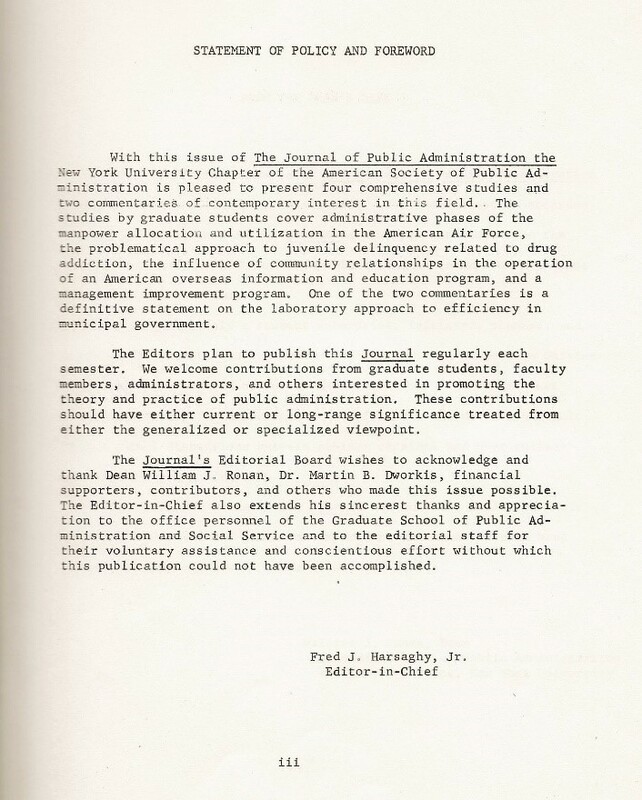 In effect, we had three workstations first and foremost for our administrative offices at hundred and 35 E. 65th St. on the corner of Lexington Avenue, NYC. 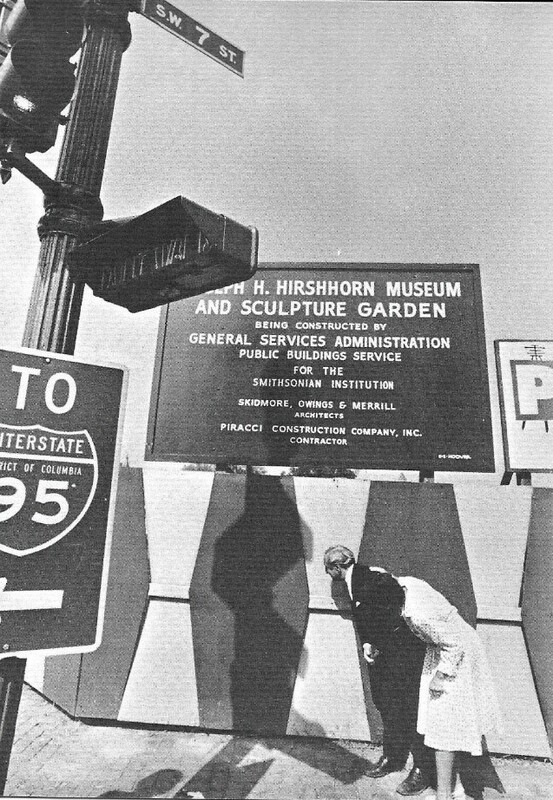 Second was the Morgan brothers moving storage company located at 21st and 10th Ave., NYC; and the last but not least was the budding Hirshhorn Museum and sculpture Garden, Seventh and Independence Ave., Washington, DC. In June 1970, when I reported to work in New York City, the 65th St. office was the hub of our museum activities. 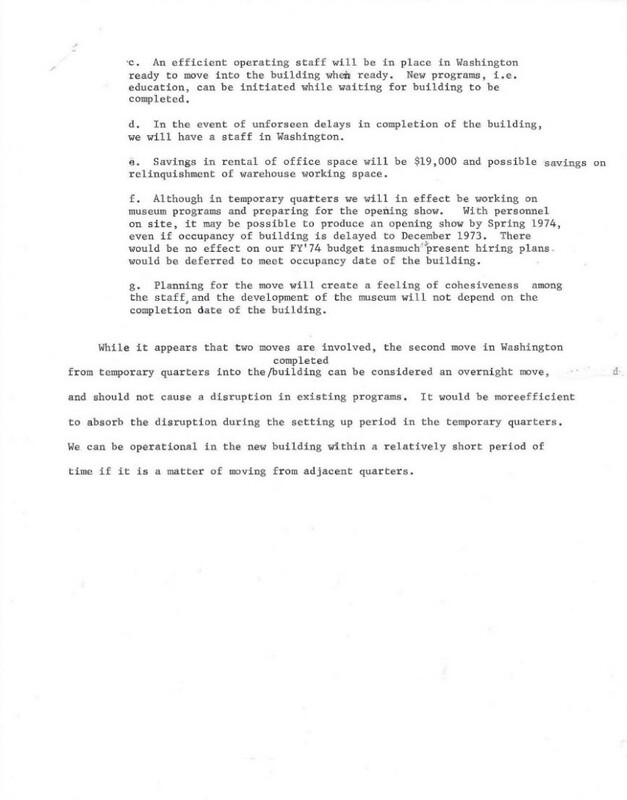 It was a three story brownstone type building, with staff occupying the top two floors. We broke out the walls on the second floor and set up the library area; on the third floor, space was allocated for the administrative office. 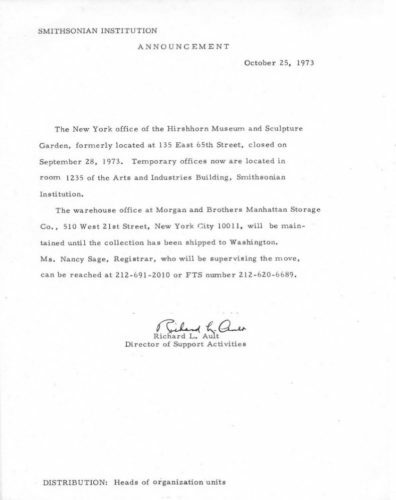 A cadre was assigned to the Morgan brothers storage facility, when they began the huge task of taking inventory of all the artwork stored at that facility. This was a very important assignment because on completion, we had to computerize listings; one was the itemized 6,000 artworks that Hirshhorn had donated to the Smithsonian and the second contained Hirshhorn’s personal collection, which was not part of his gift to the nation. Al Lerner, with the help of his learned staff, developed an initial list of about 1,000 paintings and sculptures from the initial Hirshhorn donation of 6,000 works of art. 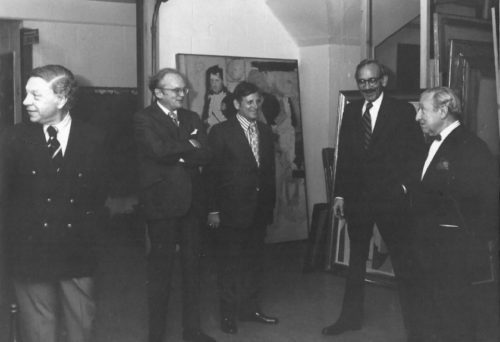 Then Mr. McGagy, the chief of the exhibition department concentrated on the setting that would be most appropriate for exhibiting each work. Mr. Simon’s staff came up with the idea of creating a scaled-down model of the circular floor (1/4 inch per foot). The miniaturized replica of the Museum that was 11 feet across with cutaway sections. 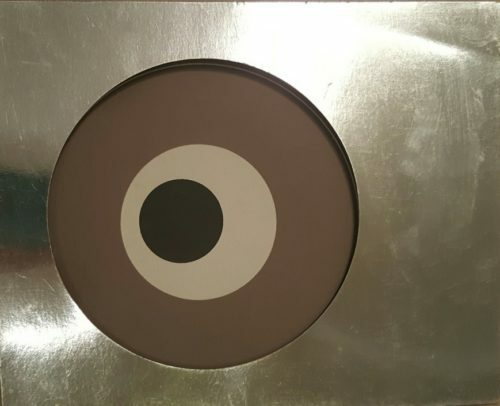 We created the floors in the museum, our staff photographer made copies of each painting, which were reduced in scale to the size of the walls, in this way it was easy to magnetically attach the photo to the wall. This painstakingly task of comparing the different views offered an opportunity to select the most aesthetic combination of size, shape and relationship between the various paintings and sculptures. The result of this checking and rechecking reduced the number of objects to be shown to 900. 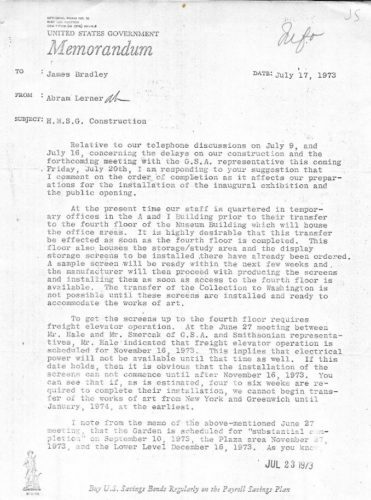 Of course, no one could project how the art would look when the paintings would be hung on the walls or how the “live” sculpture would look on the museum circular floors or if the sculpture would appear in the ethereal of the sculpture garden. The schedule was Spartan – for both my wife and I. It was more difficult for her than for me. While she was involved in rearing our two children, and keeping the homes fires burning in Washington, DC, I was engrossed in a new undertaking requiring me to be away from home four days and returning for the weekend. This enabled me to spend Friday on the construction site of the new museum. The weeks flew by into months and years. Sounds unending! But I managed to survive. My wife was a real “trooper”. Flying schedules were very accommodating. Monday mornings I boarded the 8:00am. flight from Washington, D.C. to New York – Eastern Airlines had inaugurated a no-advance reservation shuttle flight, which departed Washington National Airport every hour on the hour, to NY La Guardia Airport. If a plane was completely filled, Eastern assigned another plane, even if only one passenger was waiting. 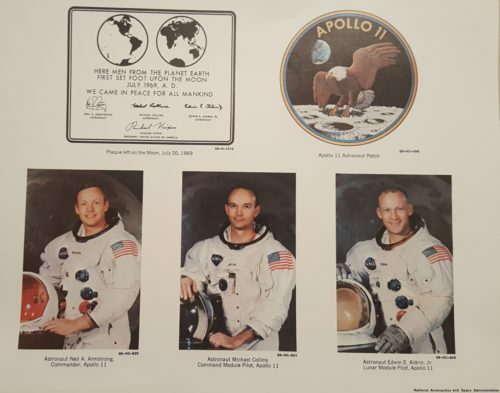 It was an hour flight, frequently on time; I arrived at LaGuardia Airport, hopped a cab, and scooted over the 59th Street Queensboro Bridge and a half-hour cab ride to 65th St. and Lexington Avenue. I reported to my office by 9:30am where I worked to 5:00pm and usually took work home. My social life was limited, by choice. I had the opportunity to meet some of my family for dinner, but regularly I had dinner at my sister-in-law’s apartment, which was my home away from home. 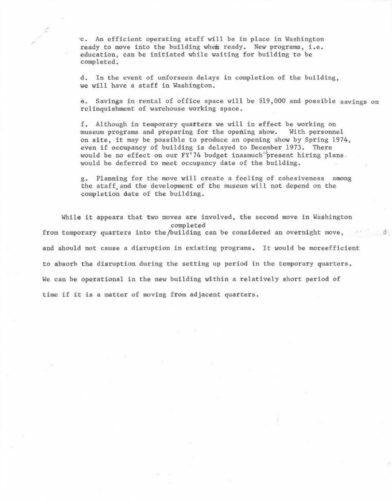 Working at night included poring over the building floor plans, and assuring that sufficient office space was allotted to the administrative and professional staff. 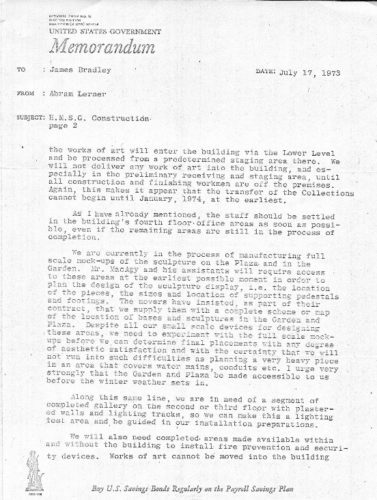 Furniture and equipment requirements also received a lot of prior attention. Returning to Washington on Thursday afternoons worked out very well. By a stroke of scheduling luck, American Airlines had regular service between NY La Guardia Airport to Washington National Airport, which departed every hour on the half-hour. If I missed an American Airlines flight at 4:30pm, I could catch the Eastern Airlines at 5:00pm. This convenient schedule helped me develop an acceptance of this difficult separation. 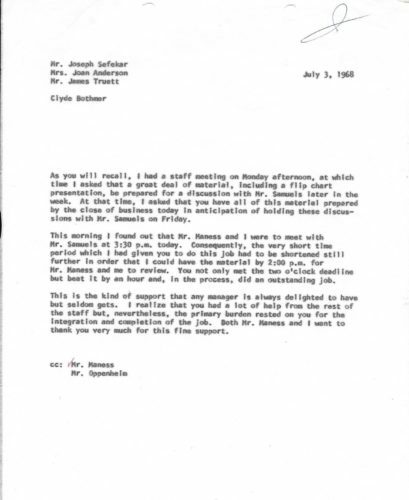 The Washington departures were similarly convenient – Eastern Airlines left at 8:00am and if I was delayed, American Airlines had an 8:30am flight. 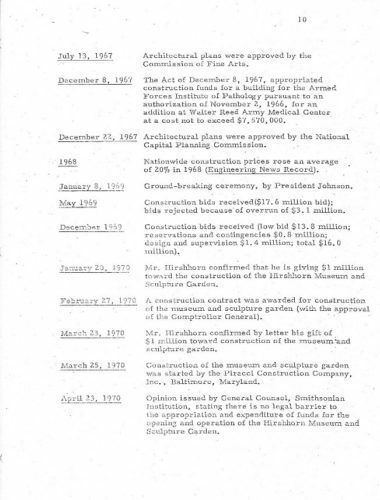 What helped in the beginning was Hirshhorn’s agreement with the Smithsonian that the museum would be constructed within two years. It was a lonely existence. Having been a New Yorker, I did not feel that I had to take advantage of the bright lights and Broadway shows. I just wanted to do my work and high tail it back to Washington every weekend. During the first two years, I did get my vacation time and managed to take some trips overseas. 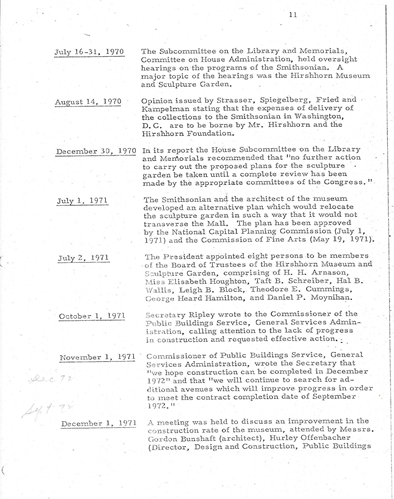 The planning was progressing very well, but the construction was behind schedule. For example, in October 1971, my wife and I were able to get away for a trip to Israel. Her two sisters, Yetta and Renee, and Renee’s husband, Harry, accompanied us. It was a stellar trip. 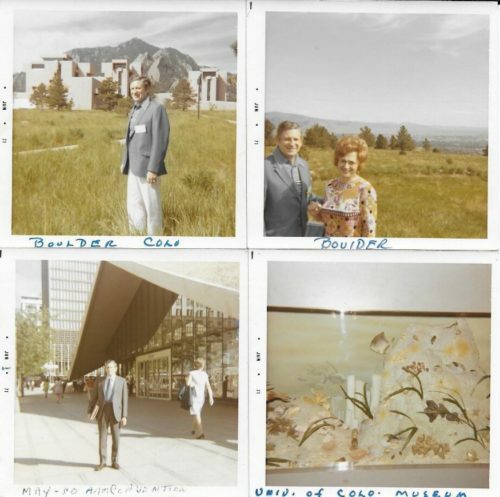 The cost of our trip was bankrolled by a legacy left by my mother, who had succumbed to declining health at age 85. She left an equal amount to my brother and four sisters. This was all she had left, and it was due only to a quirk of circumstance. My father had predeceased her by 5 months, and his life insurance of $5,000.00 with the world famous AT&T, which provided this windfall for us, went to her as the survivor. While our trip was escorted, with a travel guide to take us sightseeing we undertook some spontaneous tours on our own. One we hadn’t planned in advance was a visit to the Israel museum in Tel Aviv. What turned out to be one of the most exciting to me was seeing the sculpture garden adjoining the museum. 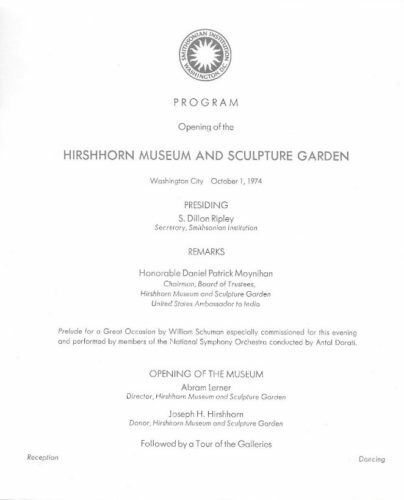 An interesting fact was that an American who donated the sculpture to the museum. He was the famous showman, Billy Rose, who through his successful investment in AT & T stock was able to amass a fortune. There were two aspects of the sculpture garden which were very coincidental; the ground cover was a layer of light brown pebbles that surrounded each sculpture. 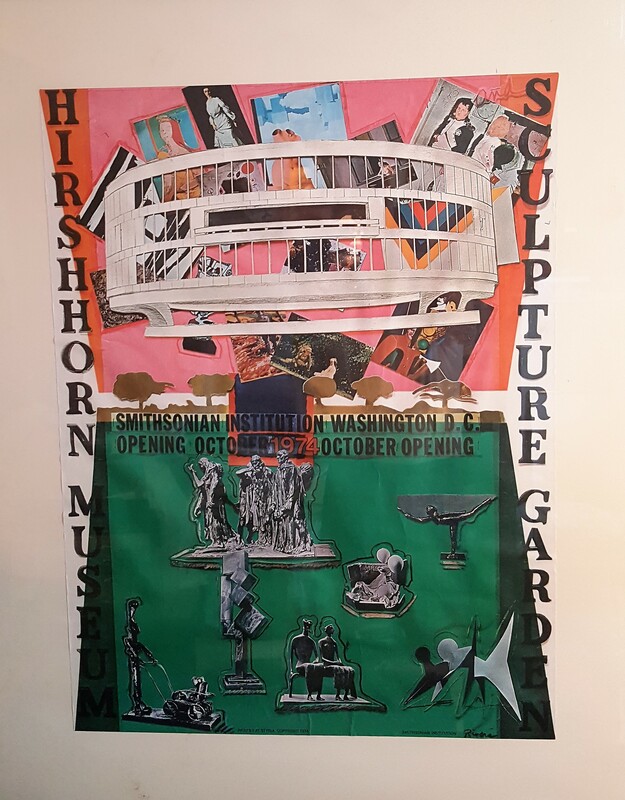 The other fact was that many of the sculptures duplicate castings of several that were in the Hirshhorn collection. For me it was like finding a gold mine. I feverishly snapped slide photos of the sculpture and the layout of the garden (** pictures to appear in the book). The ground cover motif was exactly what was planned for the Hirshhorn Museum. 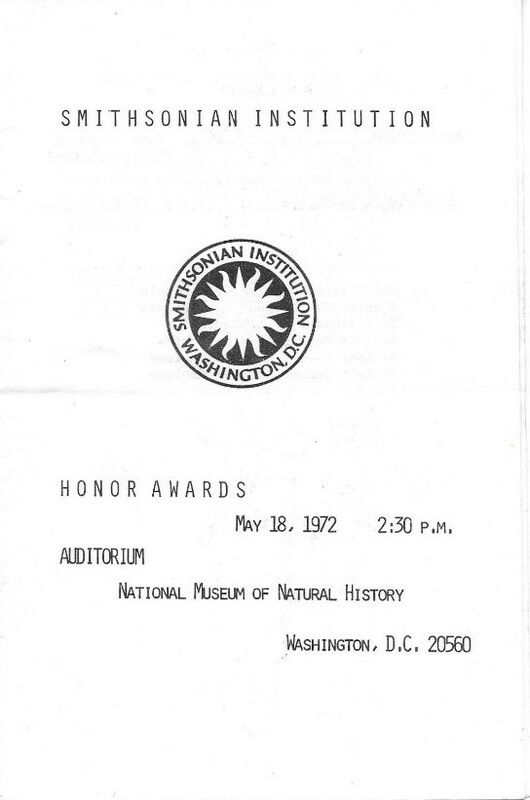 It was a feather in my cap – but had no effect on the plans already approved for the Museum in Washington. Something funny happened in the lobby of our Hotel Dan in Tel Aviv. 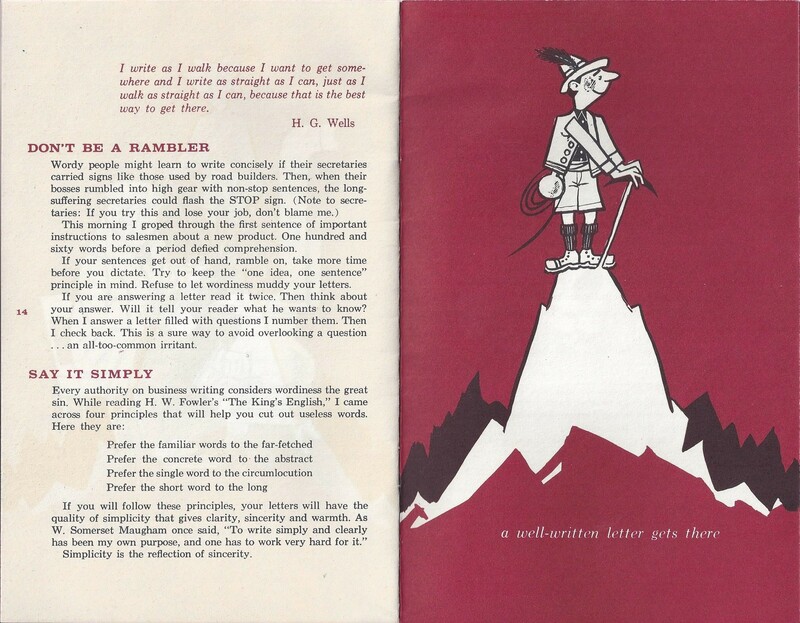 We were sitting there, chatting, when I noticed a closely folded wad of paper in an ashtray. I idly picked it out, and noticed it was a heavy parchment type paper. As I unfolded it, I could see it was a poster. I eagerly straightened out the 14 x 20 poster; I could see that it was the Knight of Death by the 14th Century engraver Albrecht Durer. It was only a printed poster, commemorating the 1971 showing of Durer’s work, but to me it was pure gold. 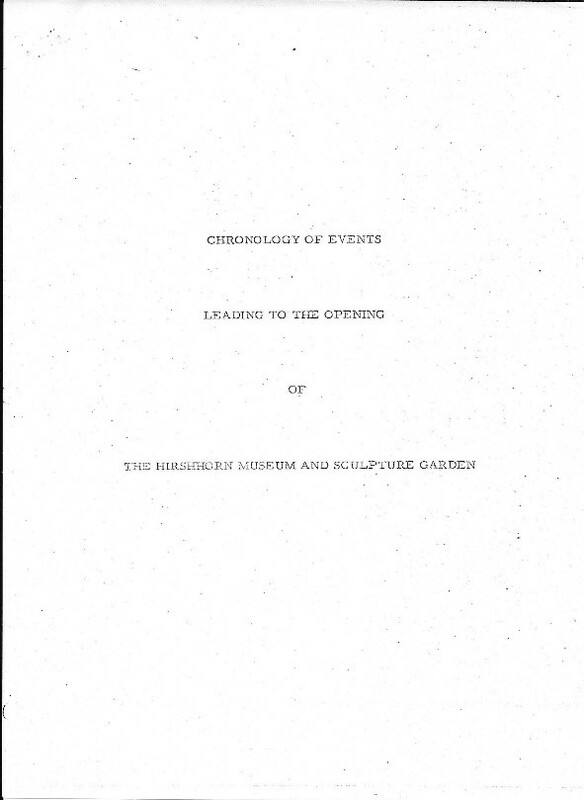 I had just happened to see an exhibition catalogue before of a Dürer exhibition at the Smithsonian Museum. When I returned after three weeks things were progressing very well, but the construction was still behind schedule. The photos below taken through my eyes show what this vacant space of prime real estate looked like. 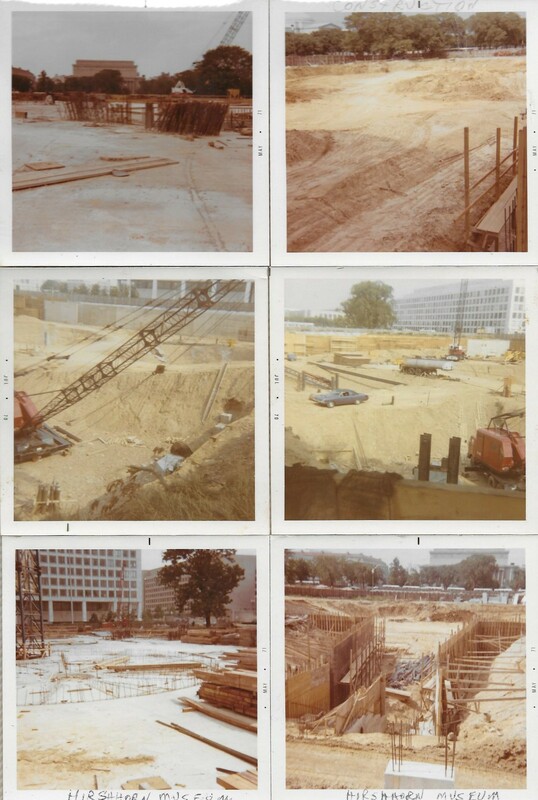 Official and professional photos of the excavation site, construction of the building, exhibits and sculptures appear later in the chapter. # 9-4 Visiting Museums out West Figure #9-5 Visiting Museums in Israel???? 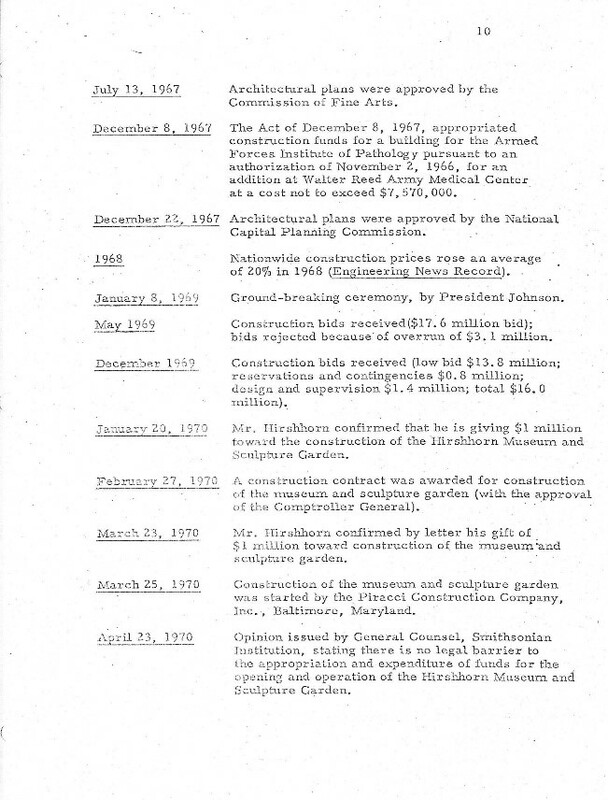 Figure #9-6 CHRONOLOGY OF EVENTS LEADING TO THE OPENING OF THE HIRSHHORN MUSEUM AND SCULPTURE GARDEN (HMSG) EARLY PERIOD 1970 to 1971. 30 years of my federal service career leading up to major budget management, organization conundrums came in handy when dealing with all the facets of this undertaking. This would include the major responsibility of handling Congressional inquiries. 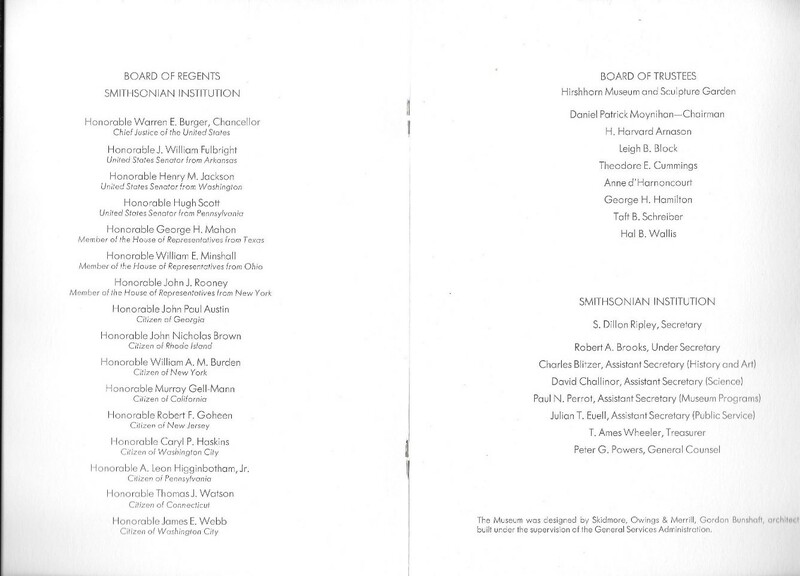 The Board of Trustees included any illustrious figures, officials: New York US Sen. Daniel P Moynihan; Theodore E. Cummings, Hal B. Wallis, etc., it was quite a world wind but I felt confident the many challenges that I had faced prior to this magnificent assignment would make the odds of success at least better than 50-50. It was during one of my lunch hour meanderings on the Capital Mall visiting the likes of the splendid museums such as National Gallery of Art and US archives that I came upon an “old piece of parchment,” that was none other than the Constitution of the United States. 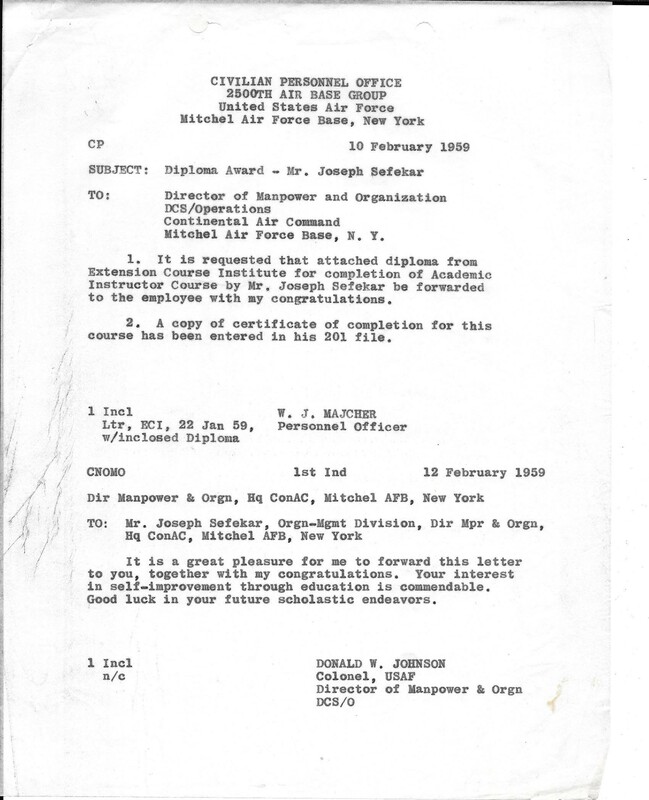 This piece of parchment has kept this country intact and guided our leaders exceptionally well. So I would take this out every so often to refresh my memory about what transpired here almost 200 years ago; when we were just a fledgling nation. 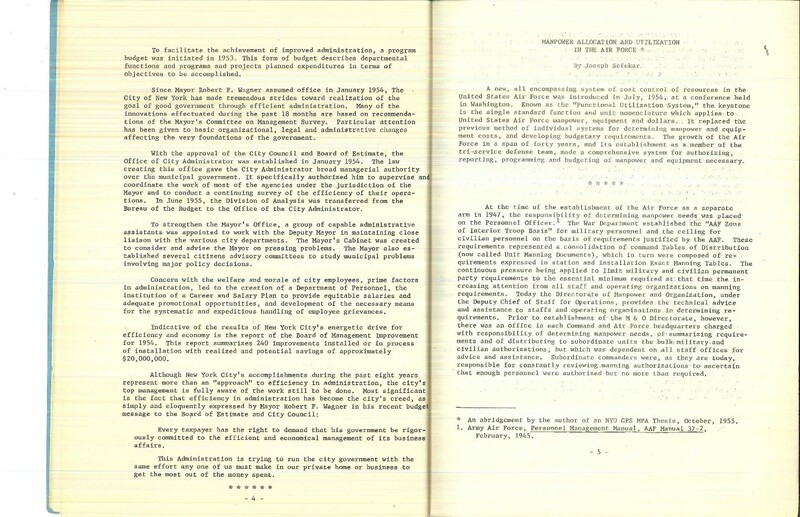 “We the people of the United States in order to form a more perfect union, establish justice, ensure domestic tranquility, provide for the common defense, promote the general welfare, secure the blessings of liberty to ourselves and our posterity, do ordain and establish this Constitution for the United States of America and the Articles,” forthwith. 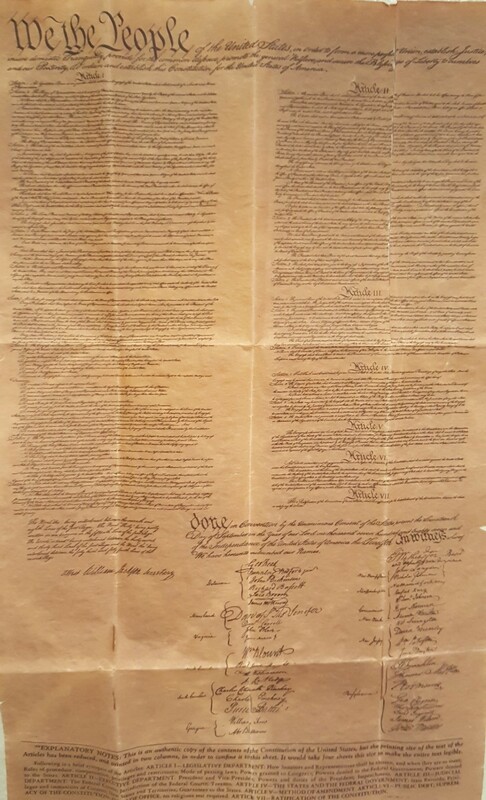 Figure #9-7 Parchment of the Constitution of the United States that I kept in my desk to help keep me focused on how I can make a contribution to this great Nation. It was after completing the consolidation of the Defense Contract Audit Agency (DCAA) as the representative of the Army Audit Agency that I was assigned to Washington, D.C. I commuted to Washington, DC for almost a year. 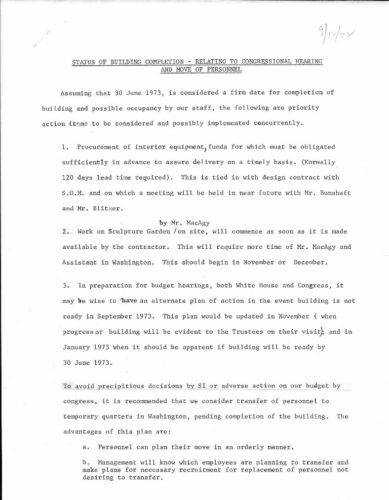 The plans were settling on deciding whether to relocate in Washington DC or to take a job that will open at the Army Audit Division in Macon, Georgia. 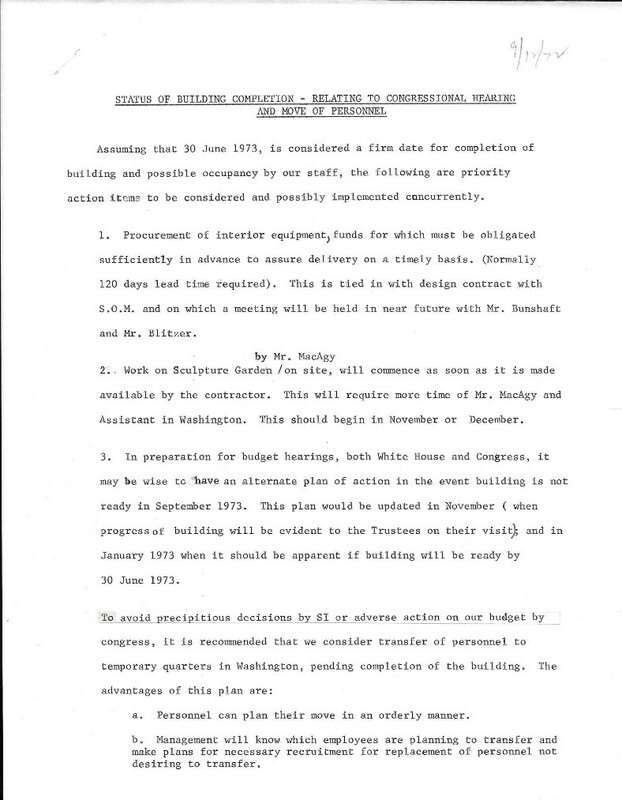 We had made a number of trips to Washington, D.C. as part of my assignment and the nation’s capital had many more advantages as opposed to being assigned a position in Georgia. After discussions with my wife and the thought of being uprooted from family and close friends we decided that the benefits outweighed the disadvantages. We took the kids down to Washington for a second visit to preview possible locations to resettle. 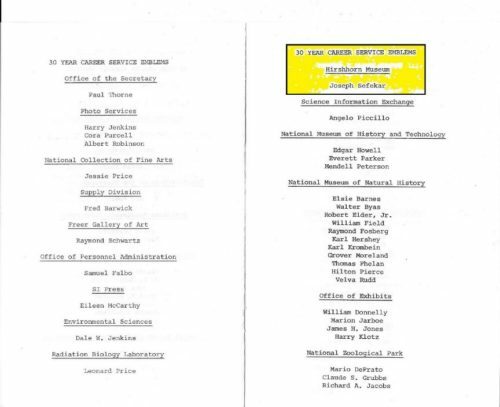 At this time my son Billy had completed junior-college coincidently enough at Nassau junior-college in Garden City which had recently opened its doors and was located at Mitchell Air Force Base where I had previously worked in the late 50s. 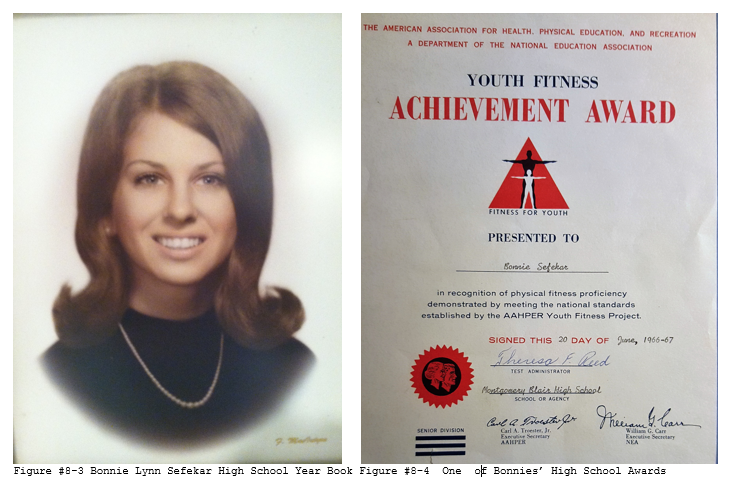 My daughter Bonnie on the other hand was completing junior high school at Syosset, Thompson Junior High. 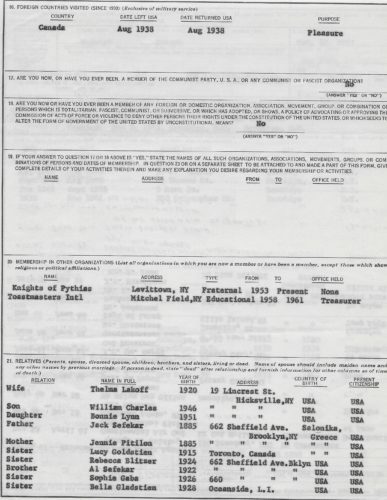 Bill graduated in June 1965 just as I was making final arrangements with the move south. As it turned out Bill was dating this girl for over year and it seemed that they were getting serious. 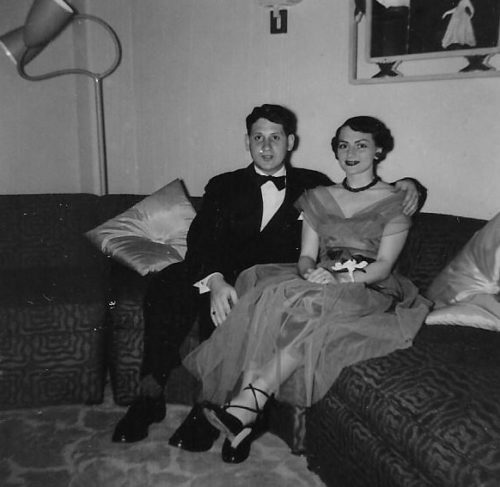 It meant that he was determined to stay on Long Island and to go to Hofstra University with his steady girl. To make things smoother it turns out that one of our neighbors down the street children on Lincrest affectionately called aunt Marion just happened to find out about our moving and because her grown-up son was going to be leaving their residence and getting married in New York City offered to have Bill stay there in his vacant room. Aunt Marion had grown fond of Billy and her husband Guy were one of Billy’s landscaping clients so they offered a special deal actually were going to charge him nothing but we agreed on $75 a month which included food board and as we later found out ironing of his clothes undergarments included. This way Bill could take his classes at Hofstra University and be close to his sweetheart. 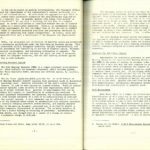 In October 1965 Thelma, Bonnie and myself made our preparation to move our belongings and life to 9039 Sligo Creek Pkwy. in Silver Spring, Maryland. Our two-bedroom two-bath was situated in a very nice area, close to the Washington, DC, Silver Spring, Maryland border. It was a delightful transition, the people welcomed us and we made a complete adjustment to this new life in the Washington DC area. We lived at Parkside Plaza and as the name implies was situated along Sligo Creek Parkway very nice park and stream. It afforded us a chance to kick back from the hectic pace of New York to the somewhat less frenzied pace we found here. This is seen from a few of the pictures of lounging at the pool and a getaway trip to some island resort with friends. Bonnie was on the way to coming a young woman in her own right. Enrolling in high school in Silver Spring Maryland, she proceeded to establish herself both academically and socially. Something would happen while attending Montgomery Blair high school that would indelibly change her life forever. The commute to DC and the Pentagon was manageable. The Washington Metro wouldn’t be ready for another eight years. 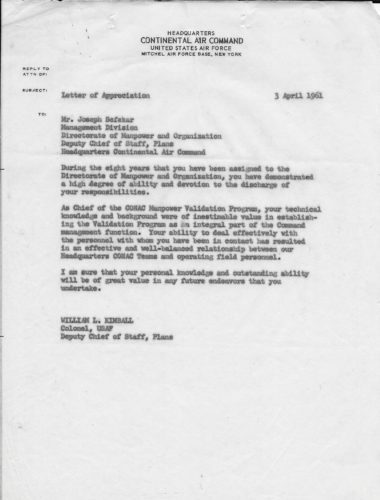 Working with the likes of Secretary of Defense McNamara and many illustrious military personnel gave me a sense of satisfaction that would make me feel this was the right decision. The capital offered so much more in the way of culture activities and a Vista of being in one of the best laid out cities in the world. Aside from that it was more pleasant than New York even with its hustle and bustle, urban maze, and sophistication. Washington as had been said and to this day offers a special southern charm to mix with strong clash of power and politics. One of the settings that Washington offers is the idea that you could be a little fish in a big pond or a little fish in a small pond. I guess the latter prevailed for me. You always would be coming in contact with possible new contacts and new job possibilities. 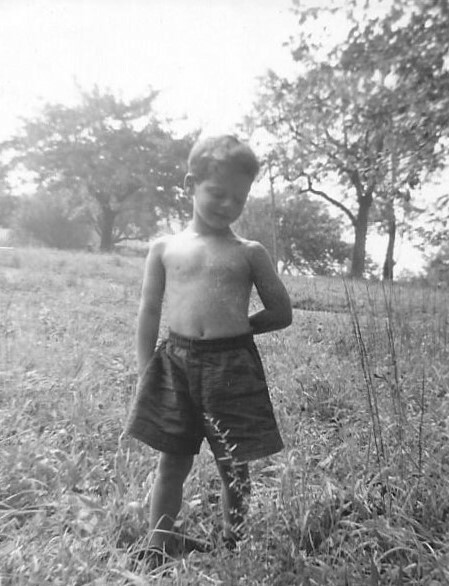 At this time, I was a GS – 9 and was not yet ready for a promotion as well as where the next offer agency department might take me. Needn’t worry my son Bill was well on his way to taking care that. 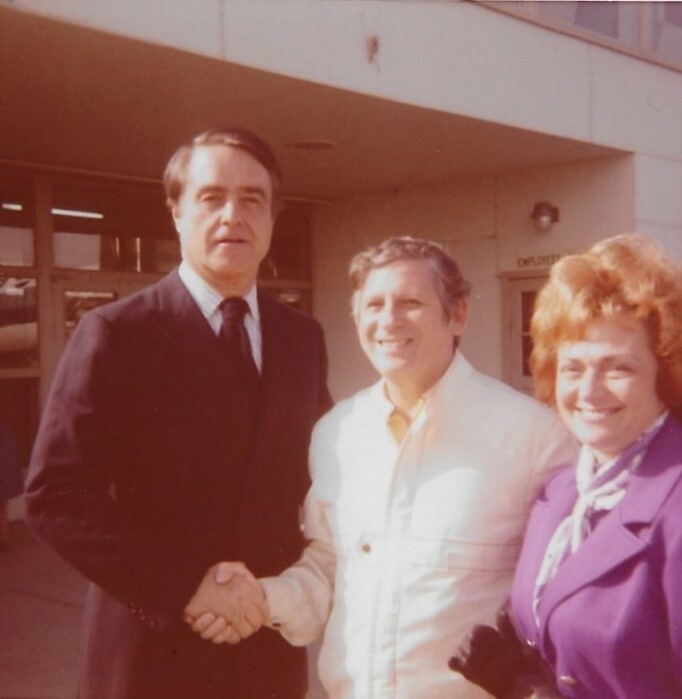 If we backtrack to 1966 Bill had made a pretty good adjustment with Guy and Marion Manetti. 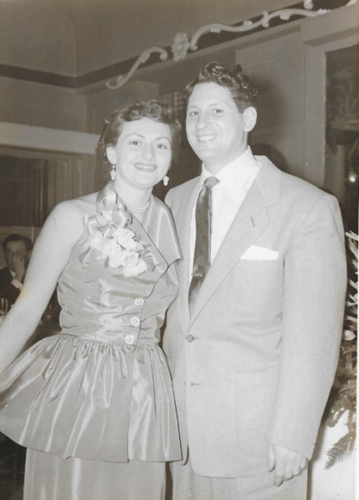 The amazing story as it unfolded was that Marion was a German war bride and shortly after World War II concluded Guy Manetti who was with the Army Corps of Engineers assigned to rebuild Germany met Marion on assignment. 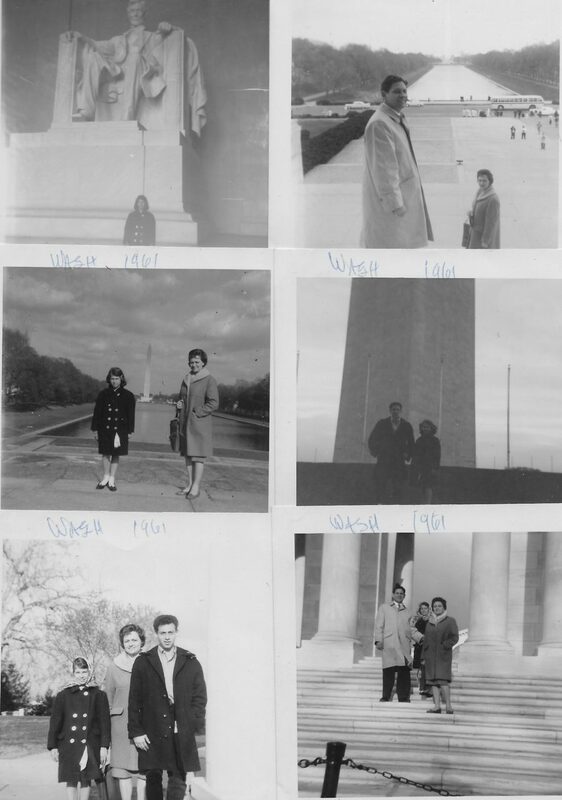 She had a six-year-old son named Peter and the three of them came to the United States after Guy completed his work with the Army Corps of Engineers. 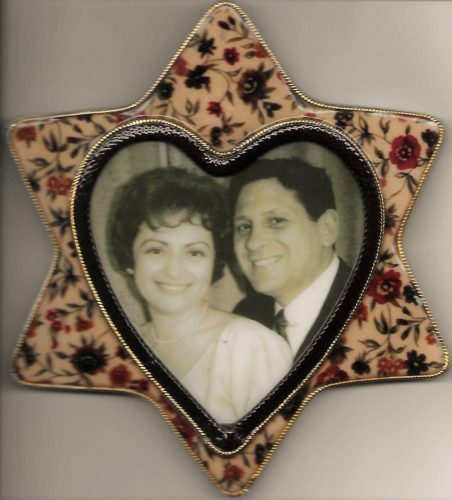 It was quite a story especially for my son to deal with being strongly rooted in his Judaic tradition even later be writing a book about the Holocaust but aunt Marion was very kind to him and he understood her plight. 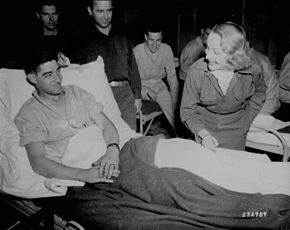 She was 16 years old when the World War II broke out and in a very desperate home situation. She married a German soldier who was subsequently killed in combat during the war and had fathered Peter. 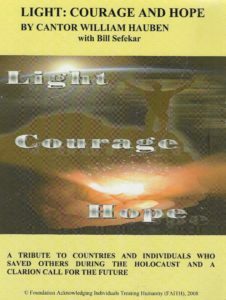 As fate would have it Bill’s trials and tribulations in Syosset that were not going according to plan. His expectations were that his girlfriend of two years was supposed to be going to Hofstra where she would have been accepted and so they would’ve continued seeing each other. Her folks thought differently and felt that they were too young to be that serious at this point. And promptly had her apply for college at Boston University. This changed everything; all bets were off and being not yet 21, he could apply at the University of Maryland, College Park as a resident still under our supervision. 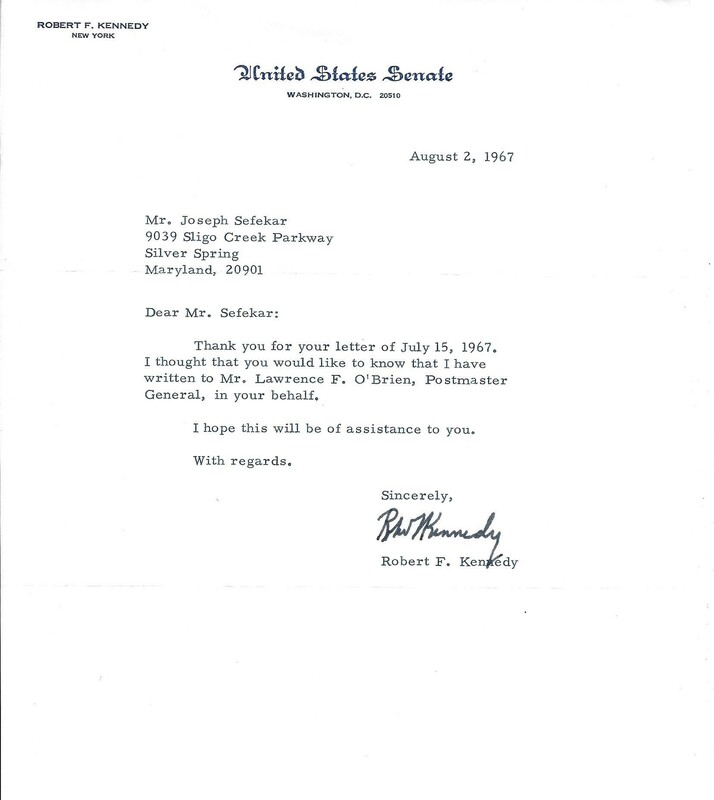 So in a matter of weeks Bill made arrangements to move down to Silver Spring. This created a little bit of an uproar as Bill can do as there was no room in our two-bedroom apartment; no problem! 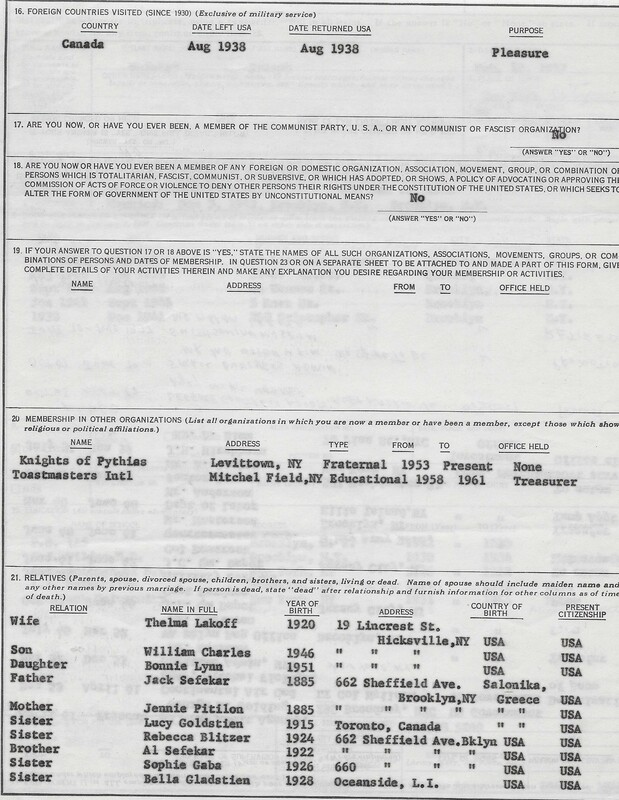 We were able to have Bill be assigned to the dormitory on campus and to take summer classes as he graduated with an Associate Science Degree in Math–Science. I know we were in for some unexpected, actually expected happenings. Whereas Bonnie was very predictable and a model child, Bill would never be predictable. When Bill’s engineering career took a turn south. This was a foreboding by my wife Thelma who emphatically stating that she would not ride on any bridges that he built, so he decided to transfer to the School of Government and Politics at the College Park campus. 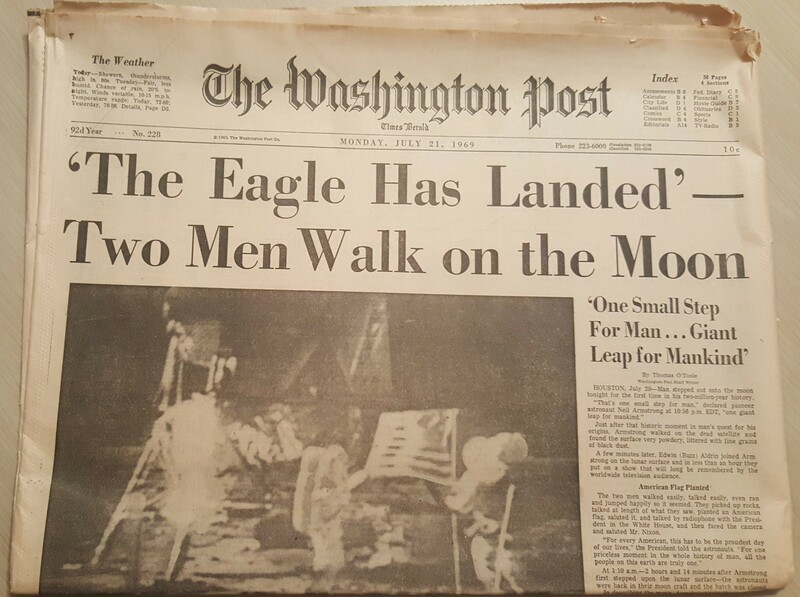 This was in the spring of 1967. Being so close to Washington DC in the center of government he would look upon this environment as one be giant laboratory from which he would be doing his observations. After completion of a seminar entitled Congressional Legislative behavior Bill felt fully competent to take a stab at being a congressional intern on Capitol Hill and so before final exams he took a breather and went down to the nation’s capital and knocked on doors to find out which Congressman might have an opening for a congressional intern. 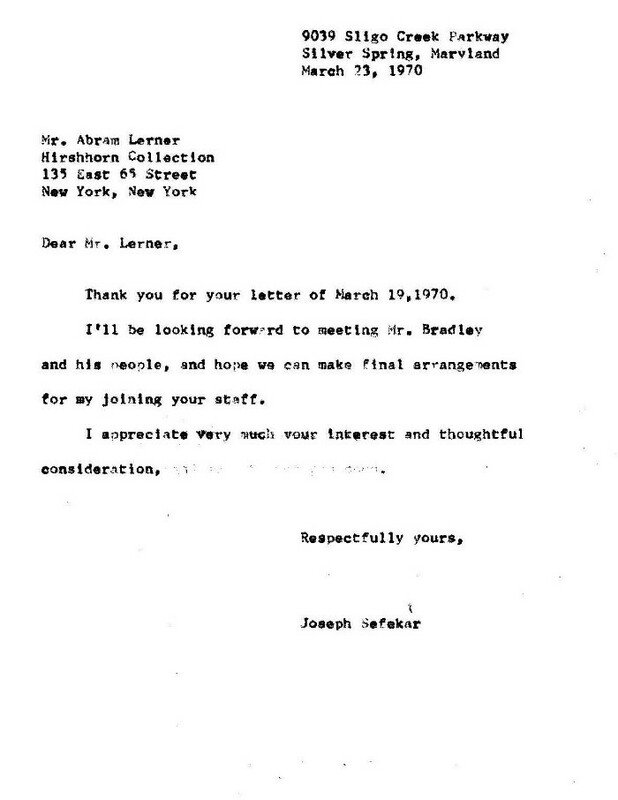 As luck would have it he received an offer to intern under Congressman Leonard Farbstein Democrat, Manhattan. Which surely surprised the heck out of us. What made this even more of a fateful encounter not only did this open up many doors and vistas for him but it provided me with a link for my next change of career in Washington. 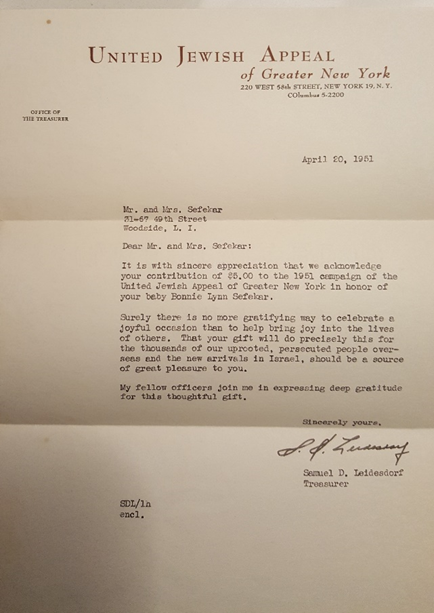 As it turns out the executive secretary for Congressman Leonard Farbstein Ethel Maness was a very dear person for our family. 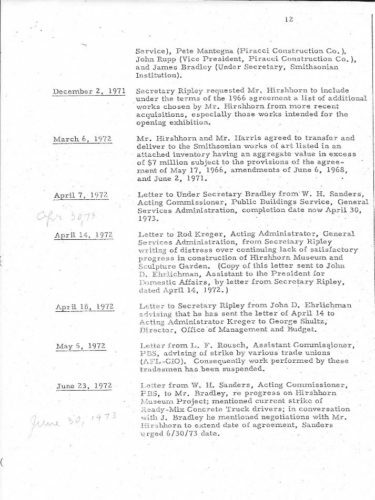 Her husband Irving Maness was a super grade under Small Business Administration (SBA). 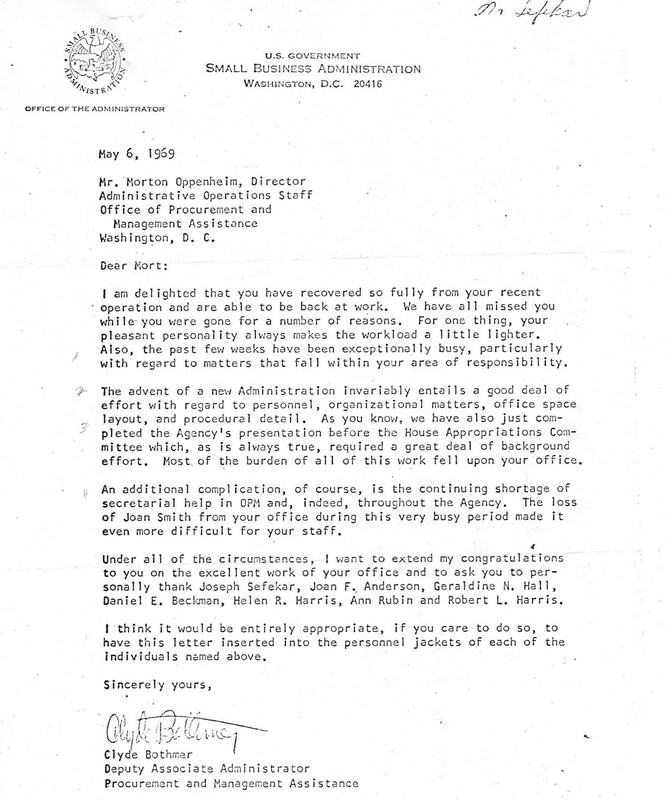 Initially I was looking for a new change of assignment possibly with the Department of Transportation which was recently created under Pres. 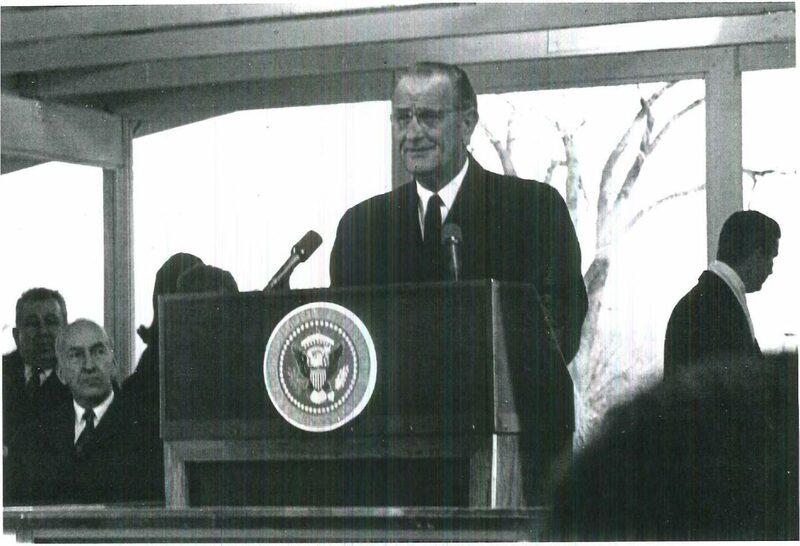 Lyndon Johnson. Fate would dictate otherwise. After Bill’s assignment as intern ended we still maintained close contact with the Maness’ socially. 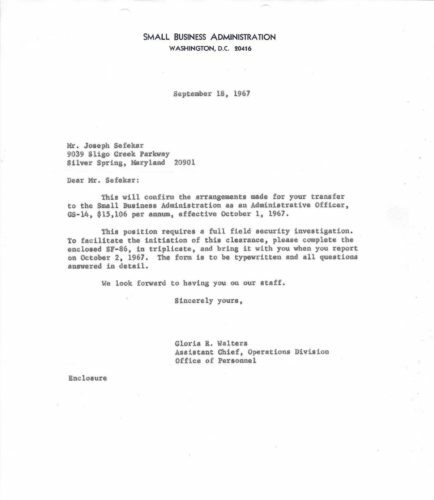 It turns out that Irv Maness would have a position for me in the Small Business Administration management office that I would jump at after 3 years with the DCAA. One incident which shows how with a little quirk of fate could change everything. We know that people are dealing with this throughout their lives. With over 30 years in the `federal government retirement system, Thelma and I were putting our ducks in order for a pleasant winding down and cessation of work. As it turns out I needed to have what was considered routine surgery for a double hernia operation. All the necessary preparation was in place and I was prepared to go under the knife for what was considered a routine procedure. Don’t remember anything unusual except when I came to and could sense there was some concern unbeknownst to me at the time the doctor performing the surgery had found an extraordinary amount of green pus that was spreading around my abdomen he had never seen anything like this before and proceeded to suture up the incision. 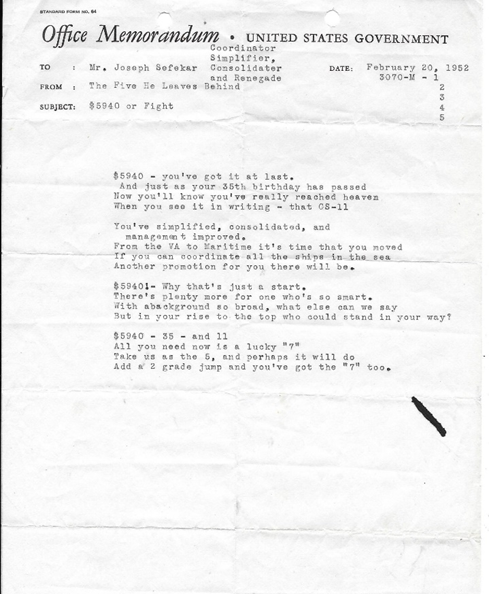 At that time, he alerted my wife and my son who had been in the waiting room of his findings. Naturally it took my wife beyond the brink, she was about ready to collapse and was beside herself thinking about all the years that we had saved in preparing for retirement and for being with our children and “grandchildren.” This was also unacceptable for my son thinking about his Dad’s condition and offered for the surgeon to consider that he’d never had any problem health wise with discomfort or anything similar. What came to mind was possibly an appendicitis attack or burst? The doctor presented us with a plan to check into the Sloan Kettering Cancer Institute in New York City where I would undergo tests to see if this was a cause for concern and whether this was malignant kind of cancerous substance. Well naturally I was taken aback and sloughed it off but still made plans to check into the hospital for the biopsy. My stay in New York would’ve been uneventful and successful if not for an incident which proved that, “I Can Handle Things.” While the tests were being taken I was outfitted with two tubes and IVs that are truly not only discomforting as you would imagine but was against my religion ha ha. So I beseeched the doctor to remove the tubes from my nose and some of the IVs. He wasn’t so predisposed and said we need to have them there for a couple more days. Well as the fickle finger of fate would have it, that night of all things the nurse on duty for the night shift started to feel some discomfort and fainted “dead on”. Saying that there was nothing I could do but come to her rescue, I ripped out the mouth and nose hoses and anything else that was inhibiting and revived her. She was most grateful and it was duly noted. The doctor was making his rounds came to my room and commended me on my quick response and made it apparent that I can keep the nose mouth tubes out for the rest of my stay. But the most satisfying part was that the results of the test showed no malignancy and I was able to have the corrective surgery shortly thereafter. And life will go on as planned. 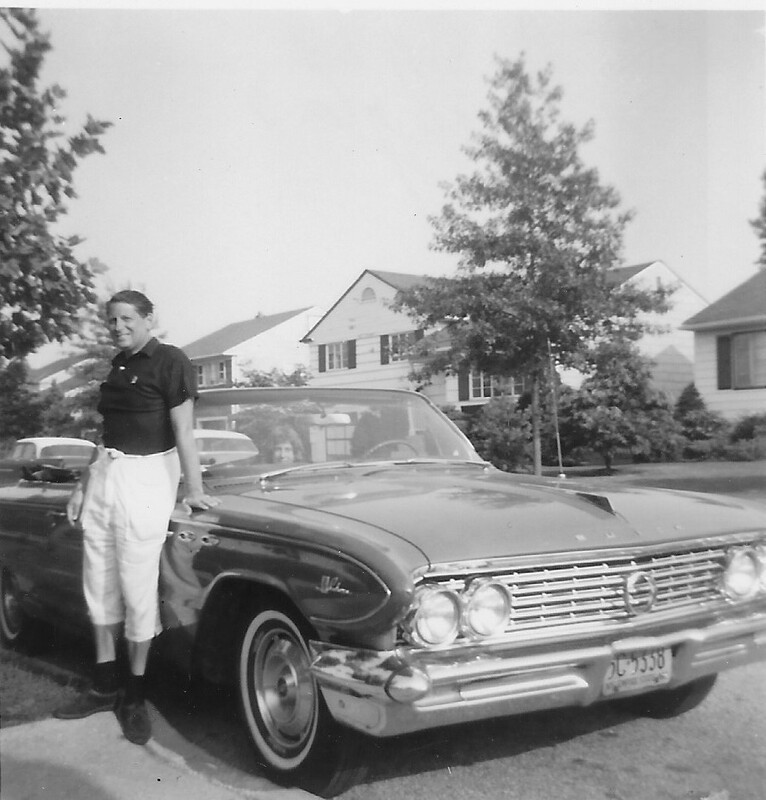 My wife Thelma decided that she would pursue a course of business as a teller in a bank. That of course was when Bonnie was old enough to arrange being left by herself with Bill keeping an eye on her. Figure #7-18 Summer, back yards, pool and fun!! 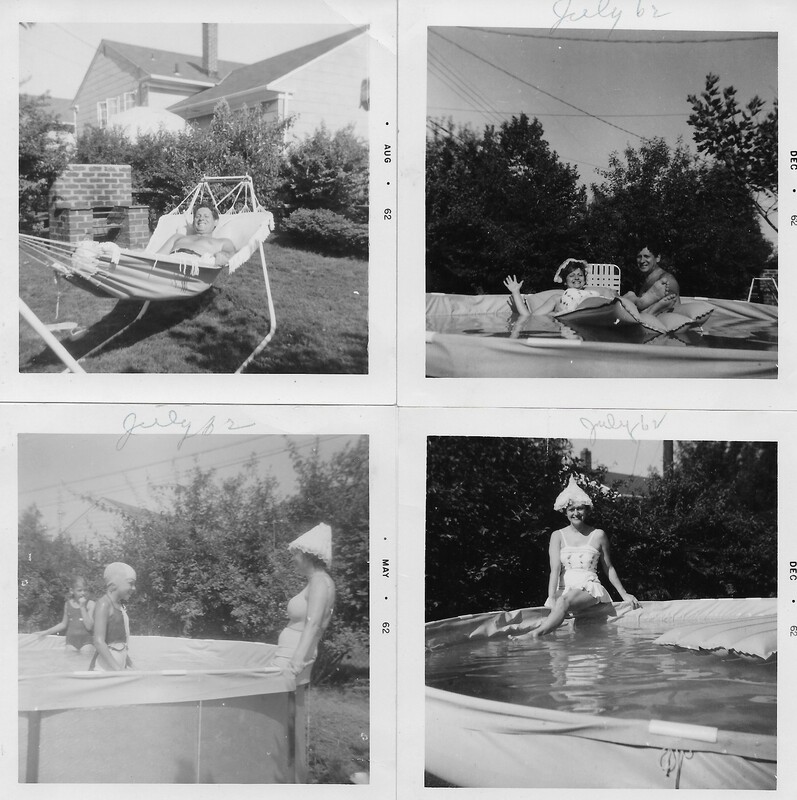 Life in suburbia had to include your “above ground pool,” which sufficed during the hot July and August months. Figure #7-20 Thelma and me with her sisters Yetta and Renee and Renee’s husband Harry. We still managed to keep close contact with our families. Thelma was particular close with her sisters, Yetta and Renee. 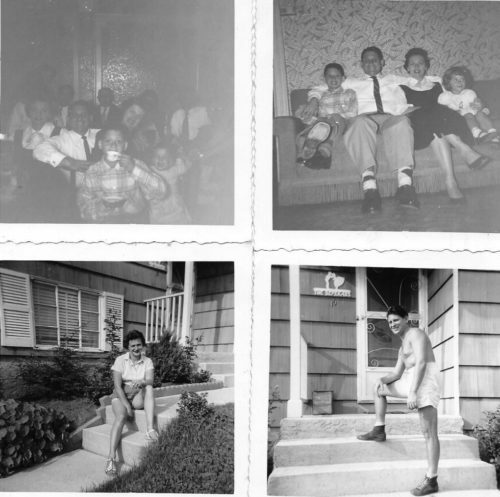 We were able to enjoy many of these outings with our neighbors on Lincrest Street. 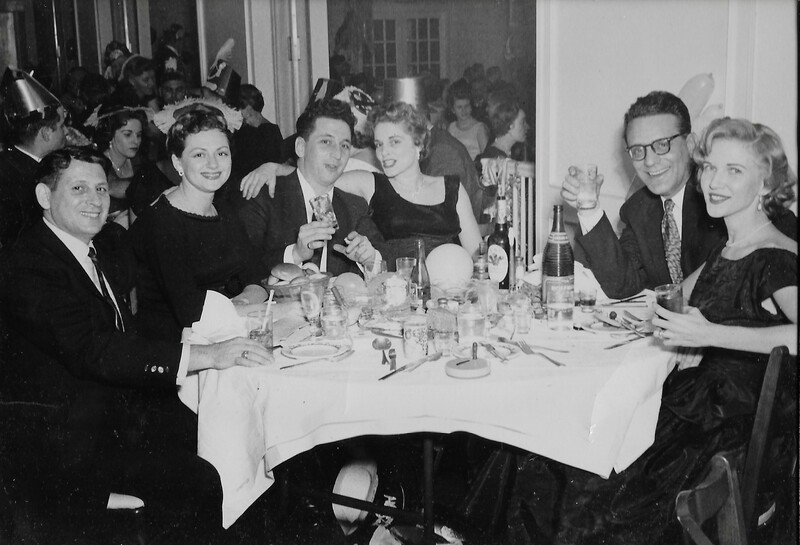 Particularly Emily and Lenny Levine and in the picture below were Leila and Chick Kornhaber. What was so attention-grabbing about Chick and Leila was that Chick owned a bagel company in New York City and we were the beneficiary of this unique culinary “artform.” You see “bagels” hadn’t as yet taken the country by storm in the 50’s. Boy were they good!! And fresh!! We were also able to maintain our culture activities and attraction with the “Great White Way,” the name synonymous with New York City’s Mid-town Manhattans Broadway district. 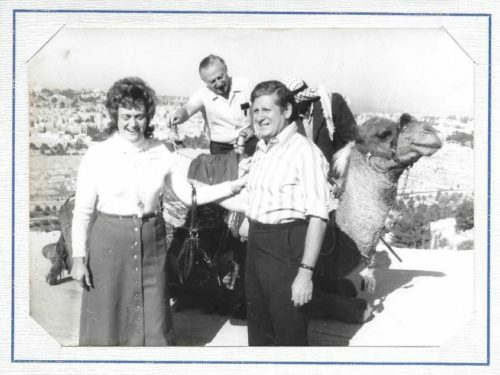 Thelma and I were fortunate to make periodic trips into Manhattan for a show or matinee. So many of these little words of advice are notable. One of the last tidbits under the heading of POWER BRAKES stands out. “A good story has a beginning, a middle and an ending; so does a good letter. If you feel tempted to ramble on, stop right there. Step on the power brakes. Come to a fast, clean stop.” In a quote from Virginia Woolf in a portrait of her father, Leslie Stephen. I hope that at least may be either my daughter or my son would pick up on this during their lifetime. Bonnie seems more of the astute type, better student than Billy. However, you never can tell, we’ll see what happens with the twist and turns and curves that we are dealt with. And one such twist and turns and curves took place shortly thereafter. Figure #7-23 Letters of accommodation, helpful future job search. 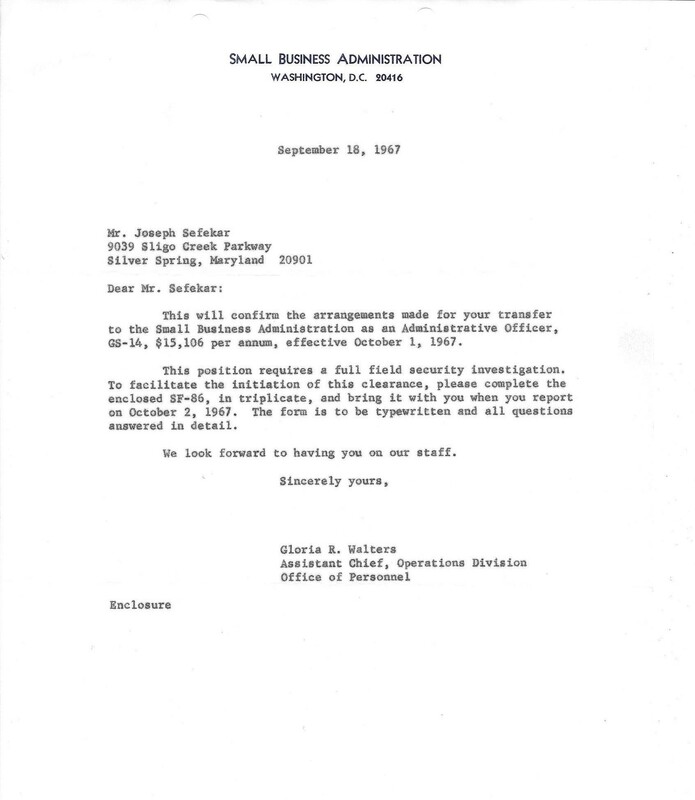 This action wasn’t sudden – for several years the scuttlebutt was that our headquarters was being moved to Macon, Georgia. This was because of the over – flying airplanes were disturbing the sprawling suburban areas surrounding the airfield (the buzzing trainer planes flown by Air Force reservists were intruding and not acceptable in the postwar peace time). 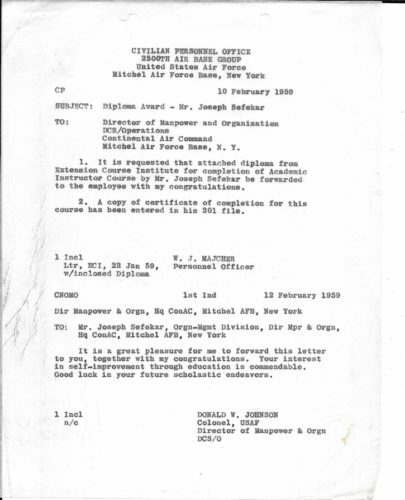 In any event, it was a decision to accompany the headquarters to Macon, or finding a new position with a government agency in the local metropolitan area, where a vacancy might exist. Although the government promised to find you other suitable jobs, there was no guarantee you would be offered a similar position at an equal salary. The long time belief that a federal government position is assured lifetime tenure did not guarantee permanency. My experience showed periodic job changes in 13 years including my military service. 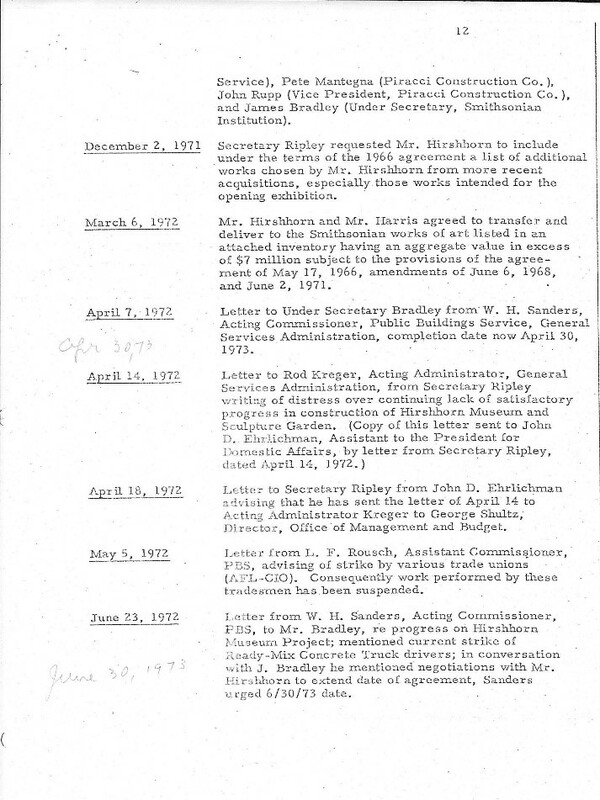 I had my list of appointments that I had already made with several agencies, including the Maritime Administration and an interview at the Department of Defense. 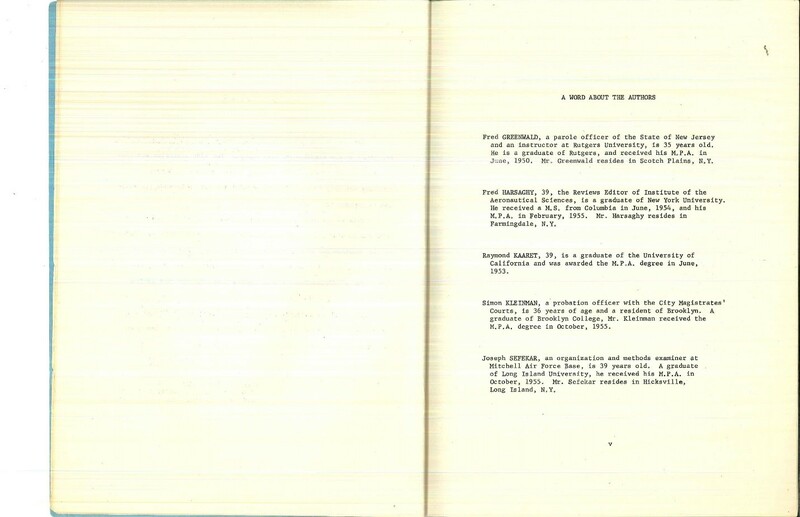 I knew the personnel officer at the Washington headquarters of the Maritime Administration. 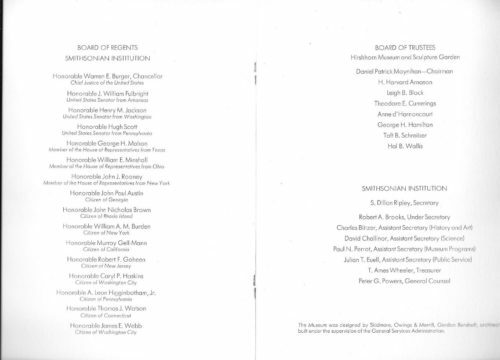 Mr. Markel, he had been the personnel officer in New York at the Atlantic Coast District. 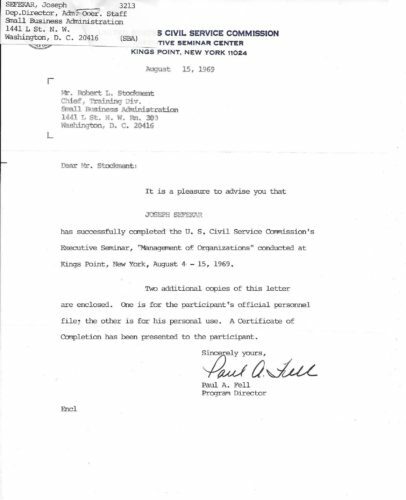 It was through the New York office of the Maritime Administration that I received a promotion from the Veterans Administration. I joined the Atlantic Coast District as a GS – 9, in the Management Division and served as a Management Analyst with the chief. This led me to a major change of life decision. 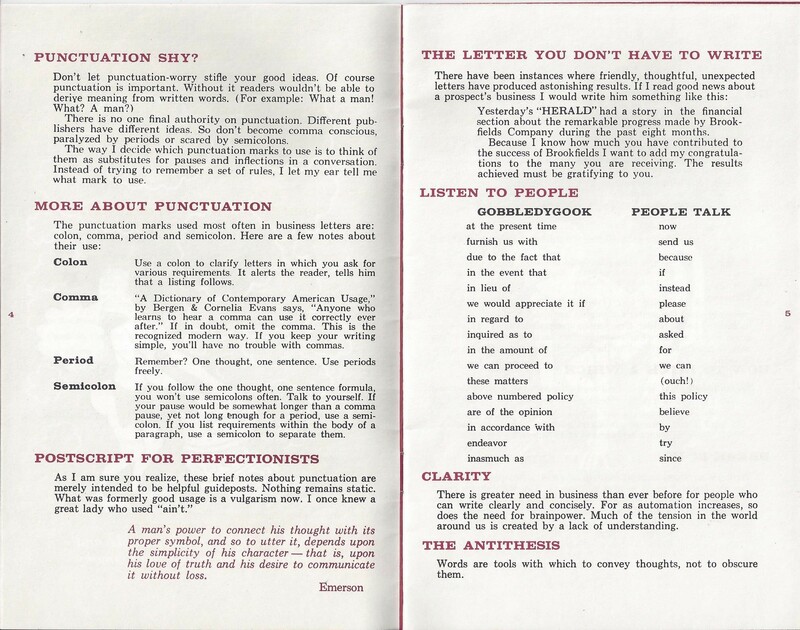 It was also time for personal advancement, one of the things going into “Speak When You Write,” was figuring how to express yourself and project what you want to your audience; whether a room full or an earful. I got involved with the Toastmasters which would afford me a chance to rediscover my self-confidence and express my thoughts better. 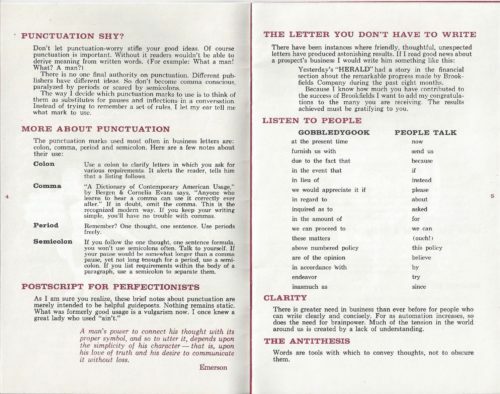 It came in handy as attested by referencing this in my Government Personnel Form 191, as a member of the Toastmasters International at Mitchell field from 1958 in 1961; being its treasurer. Fast forwarding 30 years to 1992; after “retiring.” I had an opportunity to help with the fledgling group that was being started by Lou Polur, a member of our Temple in Clearwater, Florida. 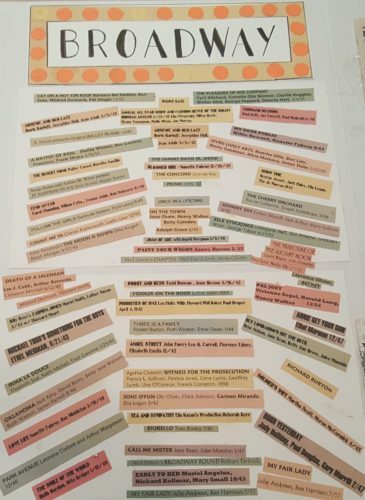 From our conversations and discussion there were the makings for starting a chapter known as the “Bagel Talk”. From what I know is still in existence for over 30 years. I recommend this organization very highly for young professionals and just about anyone interested in developing a better sense of self-assurance. My sense of humor although I thought was impeccable left a little to be desired. I found this early on when trying to be funny and affable with my wanting to impress Thelma in our early years. This did not bode well as her brother Hymie (Hy) was funny and could have a room full of people in stitches. He needed this to keep his cool being as an ambulance driver for over 35 years. But I’m digressing, how well I know that. I was always in the company of very funny people. When socializing with friends while living in Syosset two in particularly stand out. One was our next door neighbor Len Levine and the other was Nat Garfinkel. They had a story and a joke a minute. I needed to do research to come up with some clever witticisms. It became apparent while we would be carpooling from Syosset to Manhattan during the week when I was working with the Army Audit Agency. We were able to have a carpool of very good friends with the kind of humor of that bellowed and was way out of my league. 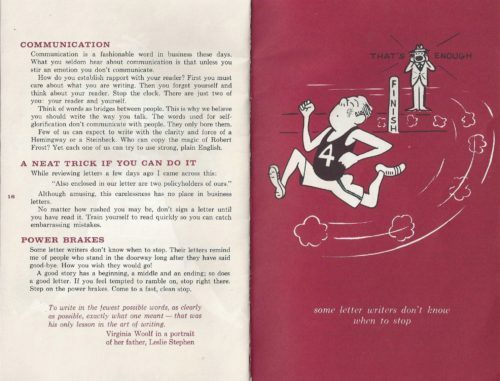 Indelibly, I would try to make a comical ad lib in the conversation, without much success. However, on occasion I would come up with a gem. So I thought, much to my chagrin I would hear moans and groans. Their reaction was Joe you come out with a funny one every 100 jokes. We now have to wait another 99 of your false impressions of humor before we can expect another reason to laugh. One of the benefits of Billy working on his landscaping business was that he had enough saved up for a car. So that when he graduated from Syosset High decided to go to Nassau Community College, he purchased with “a little help from his friends.” This two (2) year old slick red Buick LaSabre, convertible which was fun to drive around with; without him. By the time he had grown to real manhood as he graduated high school and went to Nassau community college and graduated there with his Associates degree in Math/Science and found a serious relationship it would keep him on Long Island and seriously considered settling down. To be continued… And subsequently had a few girlfriends one which was serious enough that kept him in New York while we prepared to move to Washington D.C. and the Maryland suburbs. Having made the decision to move to the burbs was quite an adjustment. “Happy homeowner” was something that didn’t come naturally, it took a lot of hard work just like a marriage. We made a lot of nice friends, our neighbors were terrific. It was an amazing time for me and my family. 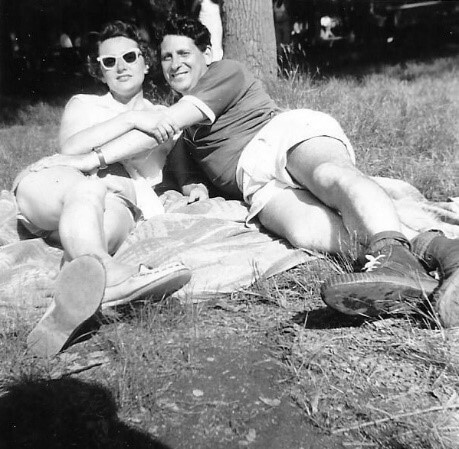 Our next-door neighbors Emily and Len Levine were very special. In addition, Thelma made some very close friends that followed her throughout the rest of her life. decided to err on the side of impartiality and said “Yar Out”. Which lead to some very harsh reactions not so much from my son but his teammates who after the game came back and voiced their indignation by chiming in saying Mr. Sefekar, “you stink”. I have spent many years making it up to him. 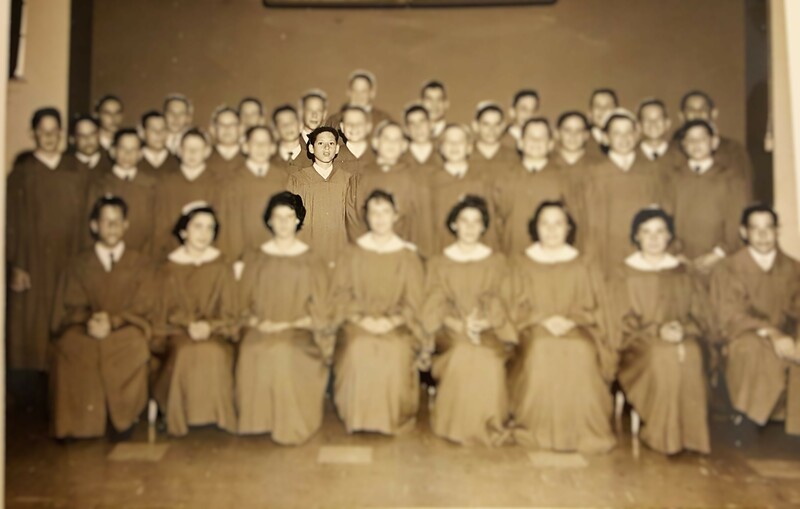 Billy became a Bar Mitzvah in 1959, when he turned 13. 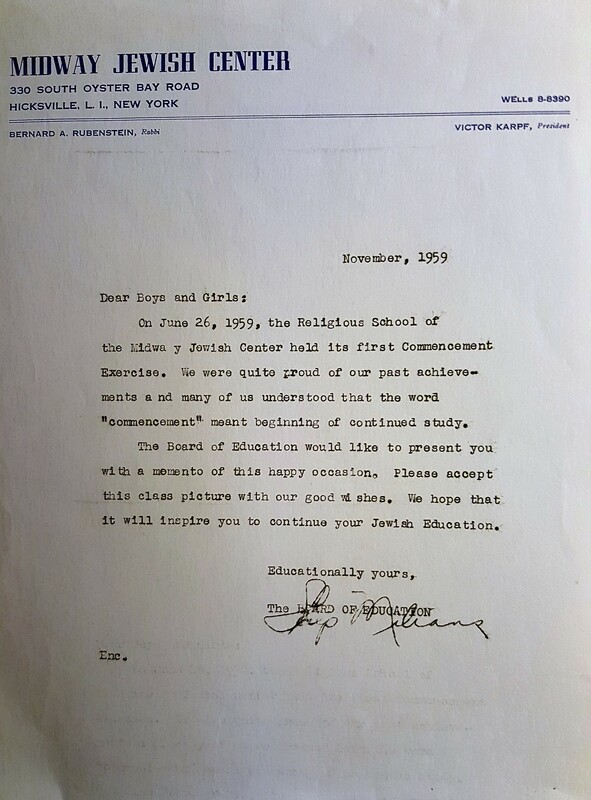 Which in the Jewish faith means that he “Becomes a Man.” Thelma and I retained lot of the memorabilia from this special event in our lives. Billy practiced religiously in spite of the odds produced a very memorable conducting of the services both on Friday night and Saturday morning. Saturday night we had a reception at Midway Jewish Center for our family and friends to celebrate this occasion. 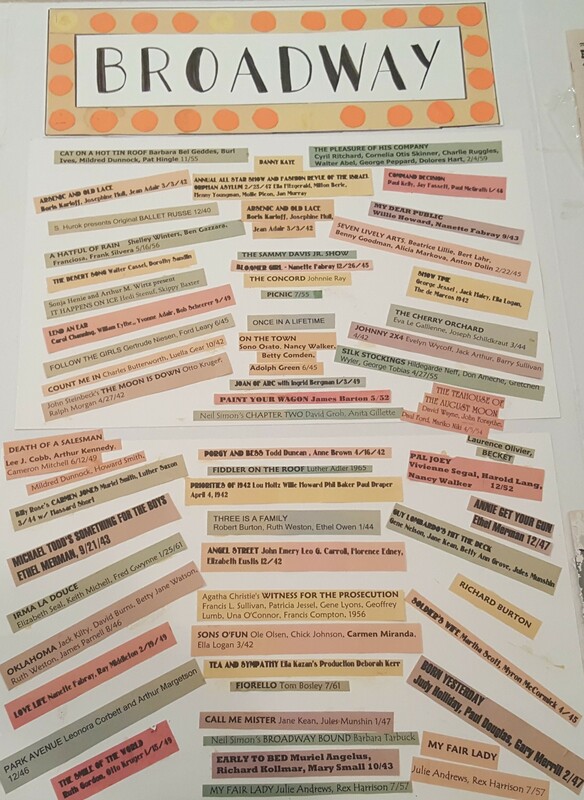 Everyone contributed something during the luncheon and even the evening gala even though we had it mostly arranged by a kosher caterer. We even have pictures to prove it (See pictures and attachments). 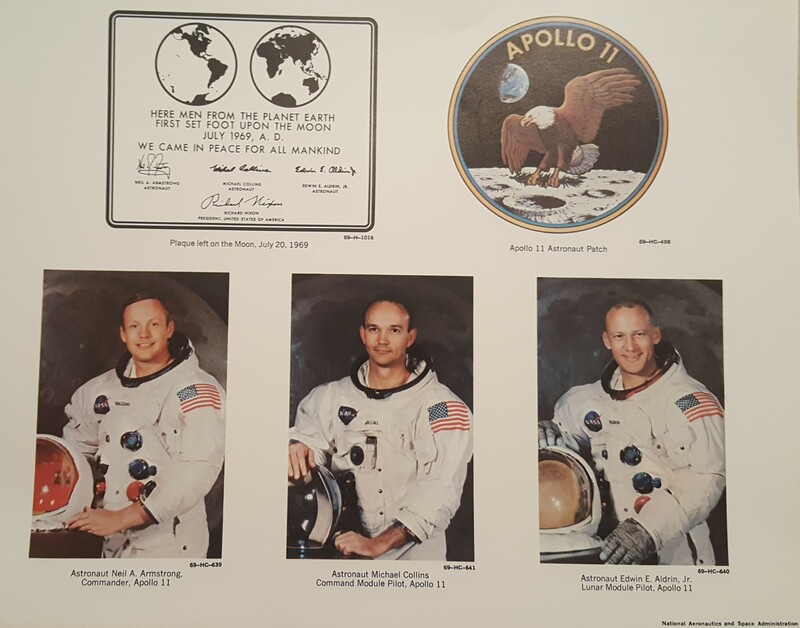 Thelma and I have a lot of the memorabilia from this special event in our lives. Billy practiced “religiously” in spite of the odds, produced a very memorable conducting of the services both on Friday night and Saturday morning. Saturday night we had a reception at Midway Jewish Center for our family and friends to celebrate this occasion. It wasn’t ornate by today’s standards and yet it cost a pretty penny when considering what my income was and what the costs were. The evening gala event is another story. 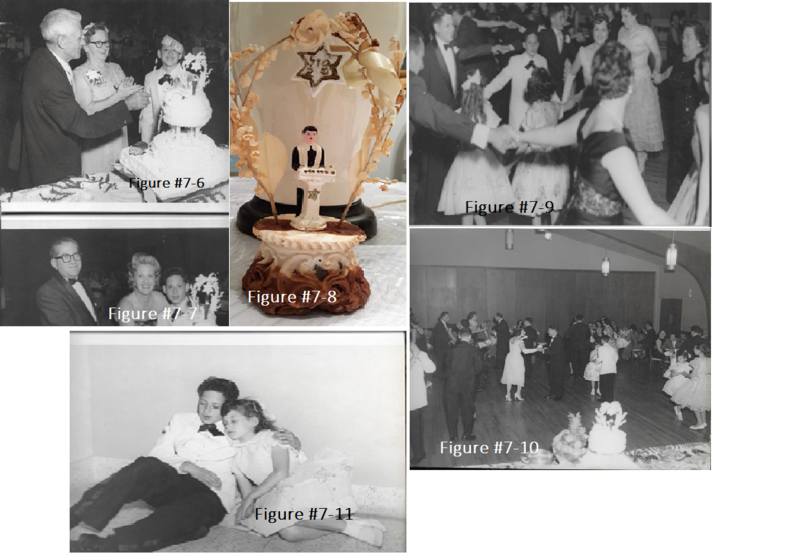 Arranged by a kosher caterer, it was quite an affair we have the receipts and pictures to prove it. $1,218 for the kosher event; $284 for the band, “The Suburban’s,” and $84 for the photographer; It was well worth it!! In order to pay off all these expenses as well as for our home and growing family it was necessary for me to apply myself to make sure that my job and career were on track. I was able to receive regular recommendations and step increases; a few are listed below. 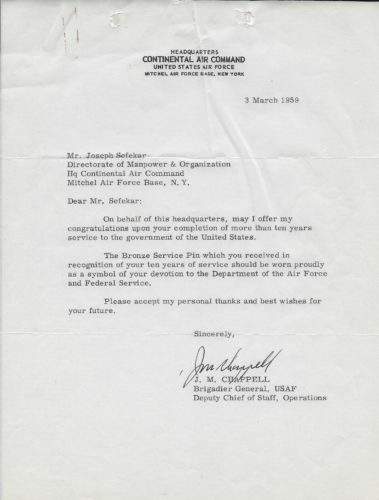 There was however a small bump in the road or in this case on the airfield as I was to find out a reorganization and relocation of the Continental Air Command(CONAC) is being put in place. 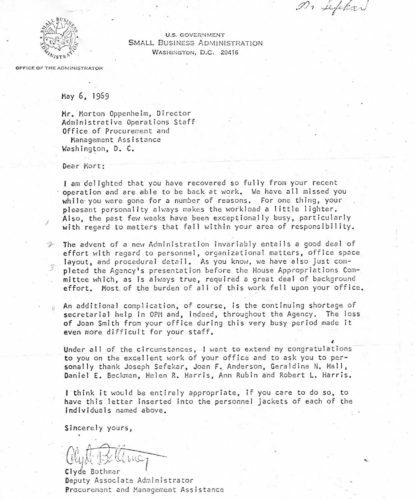 These letters of accommodation would come in handy and as I had in past encounters with finding other available government positions that usually preceded my direct efforts in contacting some of my previous colleagues in other agencies. Although not knowing where my next career challenges would emerge, I felt confident that these new changes and uncertainties will also work out and will be as rewarding. I was ready for whatever career maneuverings would be necessary. 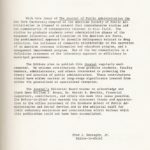 In 1946 I had an interesting assignment in activating a large regional office for the Veterans Administration in Brooklyn, N.Y. Subsequently, in 1952, I transferred to the Maritime Administration, and in December 1953, I was assigned to my present civil service position with the Air Force. It is a very challenging position, requiring travel by commercial and military aircraft, all over the country, reviewing administrative operations and procedures. In Manpower and Organization, the key words are – manpower, materials, machines, money and methods. 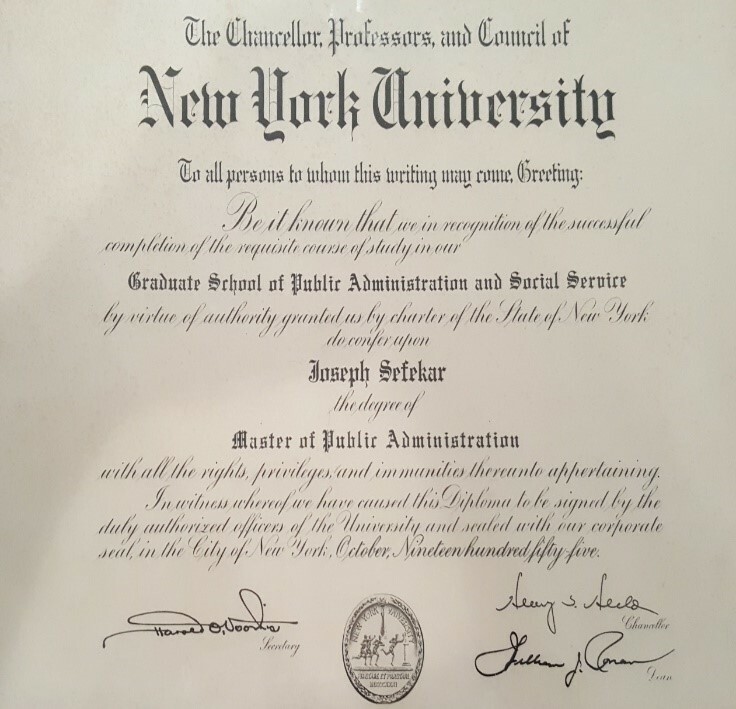 A lot of work went into this piece of paper; My Master’s Degree as anyone can attest who has received their diploma. This one though was particularly satisfying as I had received a lot of help along the way from friends and family. I promised myself it would be put to good use in the coming years. 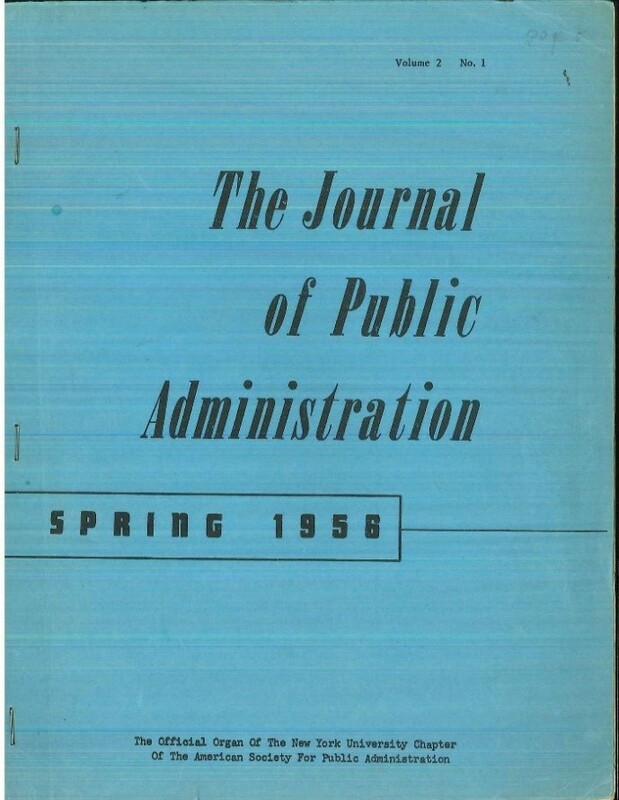 My dissertation was published in the spring 1956, Journal of Public Administration, New York Chapter of the American Society of Public Administration. 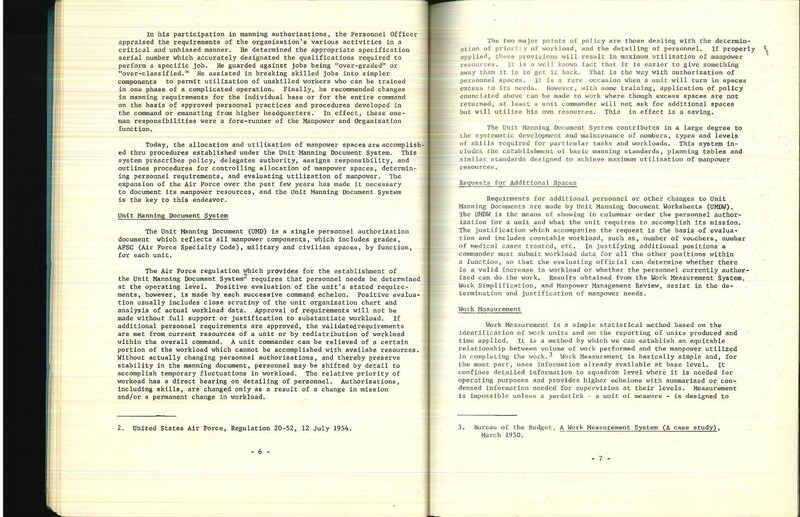 It was titled: MANPOWER ALLOCATION AND UTILIZATION IN THE AIR FORCE. 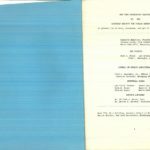 The thesis was well-received and the conclusions that I provided for stated: A commander can best improve the use of his manpower through efficient organization and effective application of sound management techniques. Of which is something I’ve always strived for. A function of command is to ensure that manpower is allocated utilized most effectively accomplished assigned missions. In addition to a comprehensive knowledge of established policies and applicable regulation of management techniques and procedures a balance of knowledge and understanding will contribute to successful manpower utilization as one continuously is able to review and to the best of their ability is able to perceive decreasing workload as well as increasing workload. Such knowledge and understanding will contribute measurably to a well-balanced, simplified organization, and will result in maximum utilization of personnel, equipment and funds. 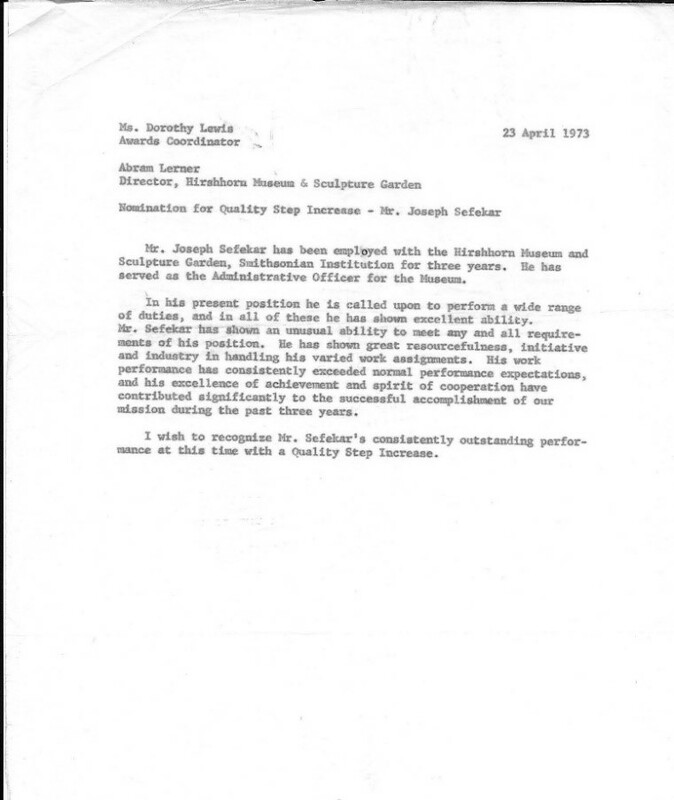 Little did I know that from this foundation and the basis of my Master’s Dissertation that it would put me in good stead not only in my immediate duties and responsibilities with the Continental Air Command (CONAC) but with future endeavors as with the Small Business Administration (SBA) and of course the Hirshhorn Museum charge and work on building the Ruth Eckerd Hall Performing Arts Center. 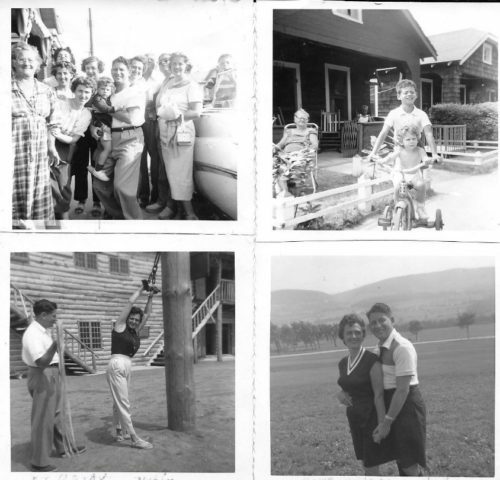 My extended family of Father, Mother, sisters and brother were located mostly in New York City. My oldest sister Lucy stilled lived in Ontario, Canada which we visited periodically. My brother Al lived near my folks in Brooklyn as well as my sisters Becky and Sophie; my sister Bella was relatively close by in Oceanside. Thank you for the opportunity to qualify as a contestant on “Do You Trust Your Wife”. I think my wife and I would make good contestants because I modestly believe we are the ideal couple. She is very understanding, logical, unselfish, wonderful disposition, clean and tidy, a good manager, and never takes second best. She is so fastidious that one night, I got up for a drink of water and before I got back she had made the bed. She has been the guiding force in my continuing my education. 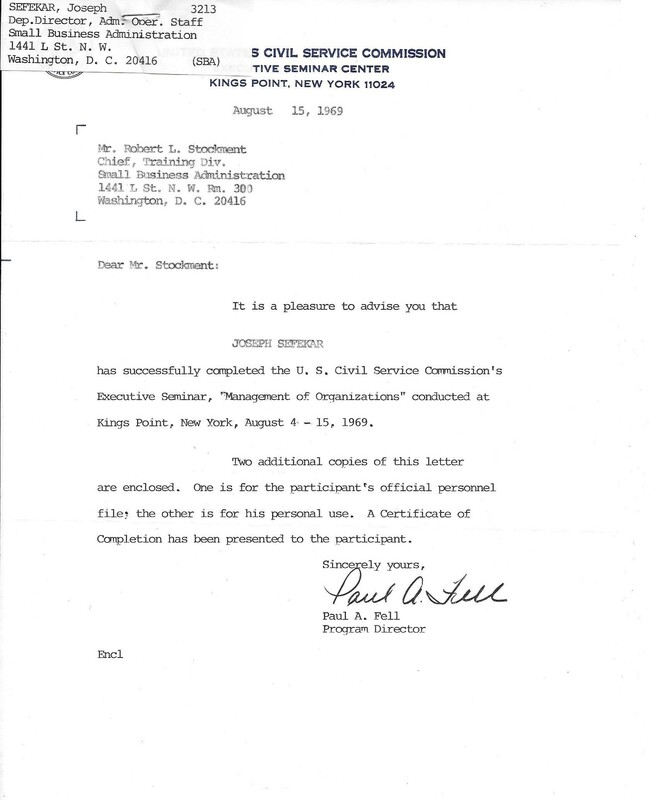 It is coincidental with this letter that, after 20 years of evening college, I am attending commencement exercises on June 6, 1956 for my Master’s degree in Public Administration at New York University. My two children, as well as my wife and our parents will attend. The many jobs I have held have been interesting. 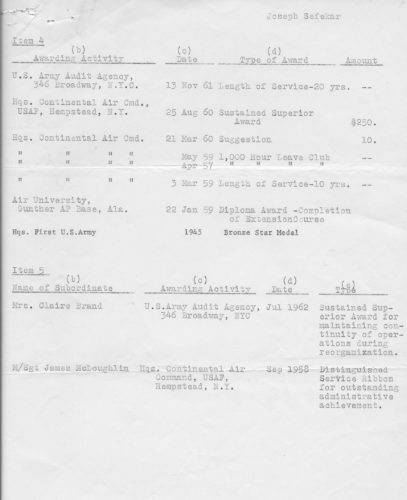 In 1943, while in service, I was selected as cadre for the advance echelon of the First Army Headquarters which was assembled in Bristol and London, England, where the invasion plans for D-Day were developed. 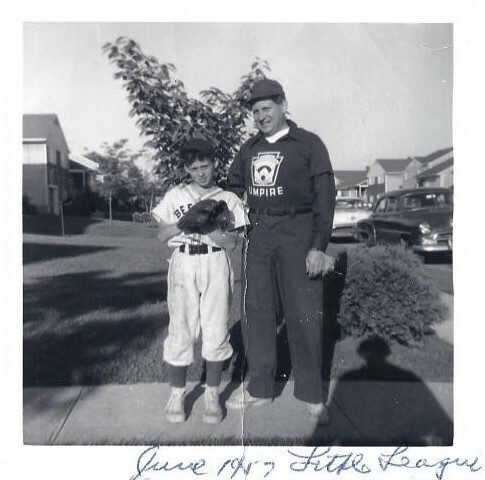 My leisure time, which I did not have much of between 1935 and 1953, is now spent gardening, reading and umpiring in the little league. Being handy around the house, I also do carpentry work, painting, laying tile, etc. I accomplish my work without a workbench or special tools, restricting myself to a saw, a hammer and a screwdriver. My wife’s leisure time also increased, because she had to baby sit while I went to school. But she is catching up since we moved into our new home 3 years ago. Monday night is scrabble, Tuesday night is movies, Wednesday night is scrabble, and Thursday night is coffee klatch. In between times, she is a den mother with the cub scouts, and attends P.T.A. meetings. (1) Our friends and neighbors all admit my wife and I are the most compatible people. On one occasion a neighbor tried to precipitate an argument just to see how we would act, but they didn’t succeed. The closest we came to it was when I taught my wife how to drive the family car. A friend warned us we wouldn’t be talking to each other, but we wouldn’t believe him. (2) Our boy, Billy is considered a real boy. None of my neighbors have ever seen him walk – he always runs. When he was 4 months old, the doctor said he was hypertensive. He was 3 ½ pounds at birth, and it took two people to diaper him. He is 10 years old and in the 5th grade. He likes snakes, insects, and girls. (3) Bonnie Lynn is considered by the neighbors to be sweet and gentle. Always has a big hello for all of them. Her responsive reflexes are remarkable. She is five and will start school in the fall. My wife and I have had a desire to travel to Bermuda. That has been one of our goals since we were married. My secret ambition is to retrace the various places I have been to during the war, with my wife, so I could live the poignant moments when all my thoughts were of home. I would go to the places like Bristol, Feltham and London in England; St. Lo, Fuererolles, and Paris, France; Charleroi and Liege, Belgium; Duren and Cologne, Germany. There are many items that we need, but if we would win any money we would set it aside for Billy’s education to make sure he graduates college in less than 20 years. My wife’s first name is Thelma. 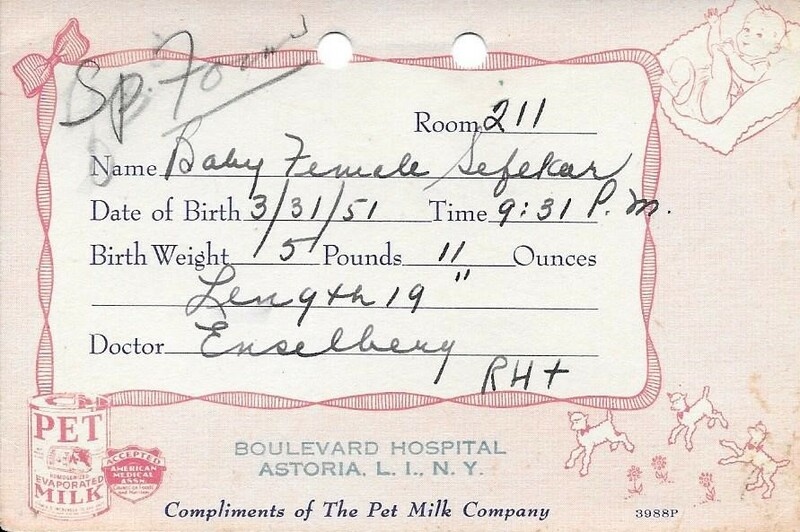 I was born in Manhattan in 1917, and she was born in Brooklyn. By coincident our families moved to Canarsie, Brooklyn. We lived comparatively close to each other, but it was 13 years before I met Thelma, when a mutual friend arranged a blind date. Even though she claims I disappointed her (her dream man was 6 ft. 4 in., etc. ), she nevertheless learned to love me. 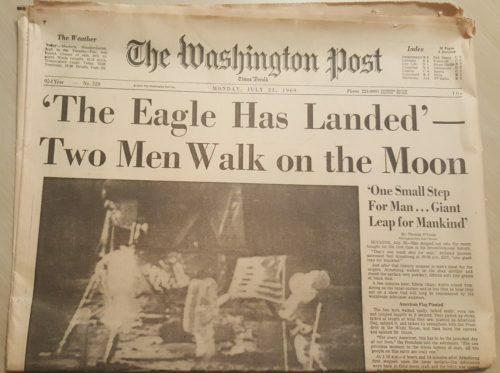 That was June 14, 1940, just 16 years ago. I proposed in a sort of back handed way. 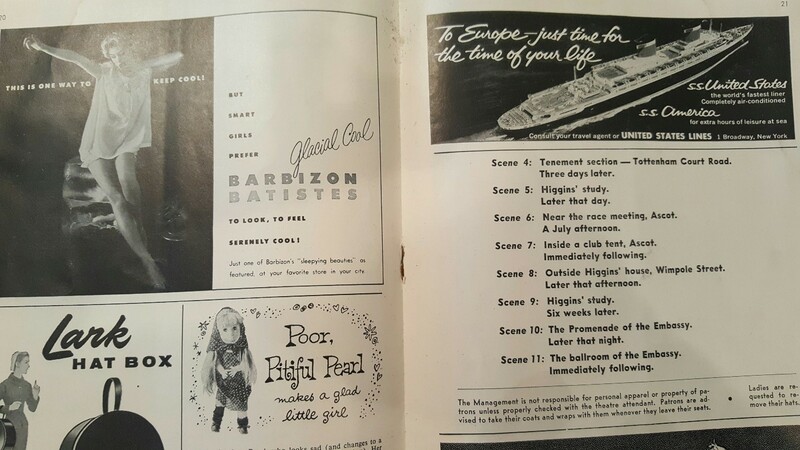 It was 1941 – tours to Miami were fantastically low ($59 including train fare and 7 days at a leading hotel). I asked her how she would like a trip to Florida, she said she would, so I said marry me and we’ll go. So she did, and we had a wonderful time. An outstanding trait of my wife is that she treats everyone with the same respect and courtesy – no matter who they may be. She gives them the same consideration, same service, and same personal attention. Her talent is the ability to put a hat together in 5 minutes, before we are going out on a date. She likes wide brimmed hats. She also dabbles in oils and has not had a lesson in her life. Her pictures are good enough to hang on our walls. Our happiest moment was when we walked into our own home. It’s the greatest step anyone can take. We have never appeared on any other radio or TV show. Being a latitudinarian, there are no particularly great mistakes that we have made. When my wife may be disappointed, I’ll say, “don’t worry, honey. Sometimes you win and sometimes you lose.” In the game of life I believe myself quite fortunate in being a winner more than I have been a loser. The turning point in my life was the G.I. Bill of Rights. Even though I applied myself to obtaining an education prior to the war, I never would have continued without a helping hand from Uncle Sam. This, combined with the encouragement and patience of my wife, has helped to advance my career. It has been a pleasure preparing this brief history, and we look forward with as much pleasure to seeing your interviewers. 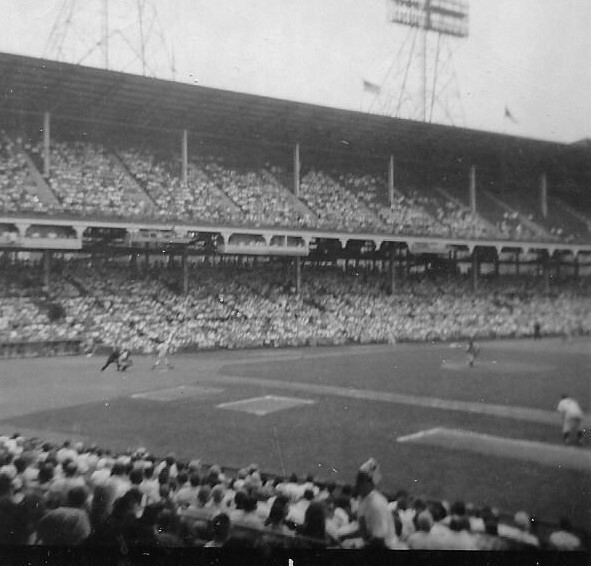 One of the things that I enjoyed doing most with my children besides their homework and lawn chores was going to the baseball game and following the Brooklyn Dodgers. The “Bums,” as they were affectionately called were a lovable bunch of baseball players such as Jackie Robinson, Roy Campanella, Pee Wee Reese and Sandy Koufax. Those were among the most popular Dodger players. they did however have to contend with the likes of the New York Yankees, “The Bronx Bombers,” and the New York Giants. I particularly remember two instances when I took them to the ballgame. The first instance was “camera day” and it allowed the fans get up close near the field. With my five-year-old Bonnie in her Brooklyn Dodgers paraphernalia she had her picture taken, with none other than the Brooklyn slugger, Duke Snider. 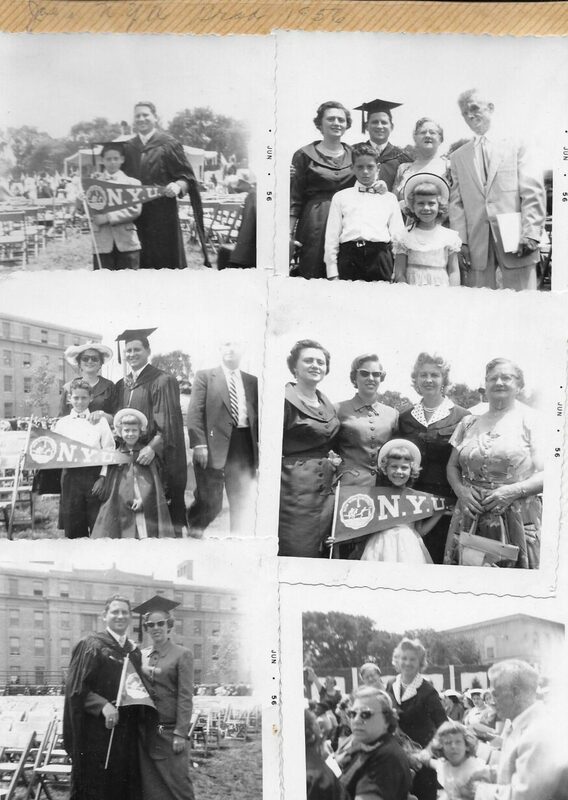 The next occurred when I took Billy to the baseball game shortly after my graduation at NYU in June of 1956. Sonny boy managed to wander off to get a better view of the action on the field. I honestly hadn’t realized until it was too late at it was better to get seats on the first base side than the third-base side where more of the “action” was. It was an eventful day and he and I were finally able to connect after my searching part of the game. Forty-five (45) years later I would discuss this in detail when I submitted an article, entitled “A Long Time Between Innings.” to the St. Petersburg Times (See Chapter 12, My Eighth Decade). Strategist, Billy Mitchell. 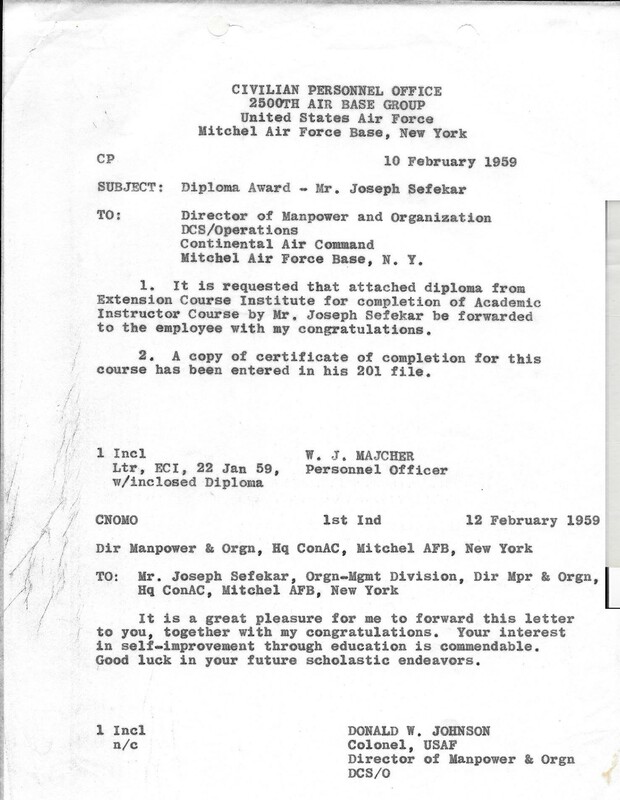 It would be a contributing factor in my selecting my dissertation topic on Airpower and Manpower Utilization which received a letter of accommodation. 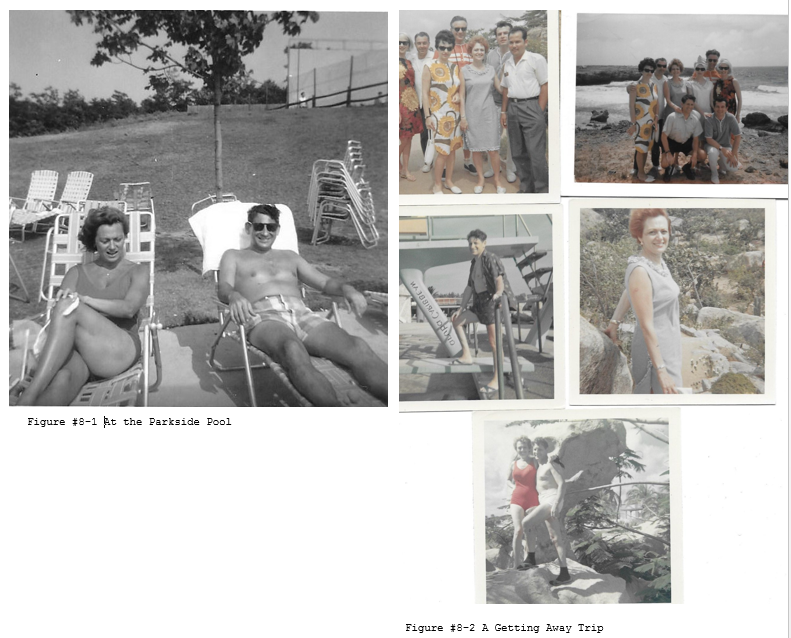 There were many vacations and trips with the children and my wife’s family to upstate New York cottages and bungalows especially in Lake Mahopac and Peekskill. 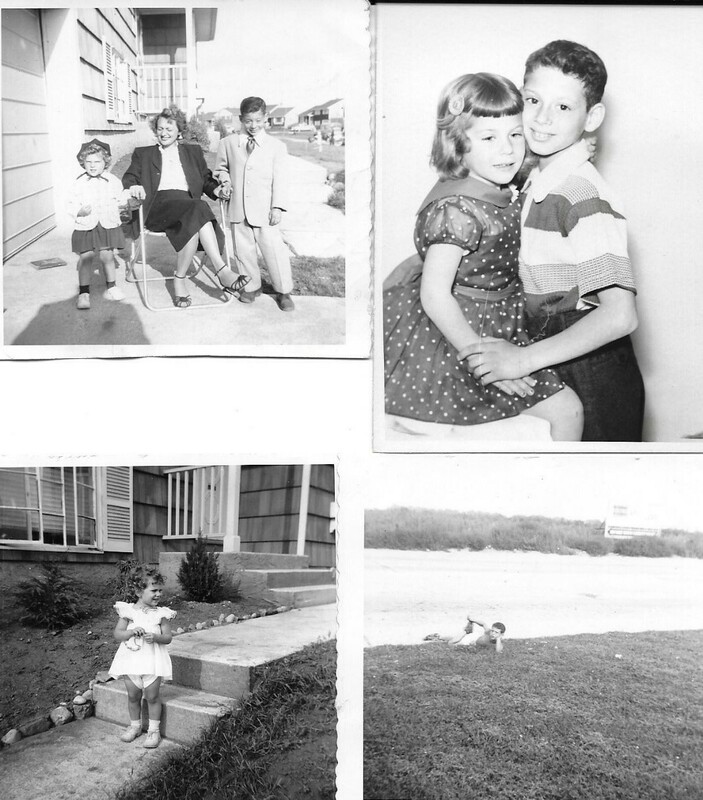 On my side of the family we invariably spent a lot of time with mom and pop while they rented their place on Rockaway Beach for the summer months. 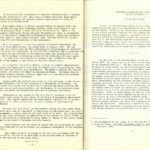 Towards the end of 1952 but part of our fortunes seem to be looking up; as we embarked on a very ambitious undertaking. 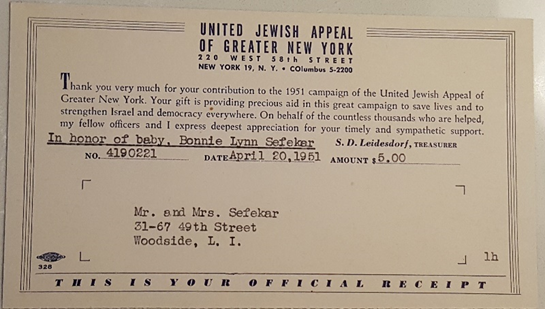 With a little help from my mother-in-law Bessie Abramson in the form of a loan and with prodding from my very dear friends Irv and Lee bagatelle. 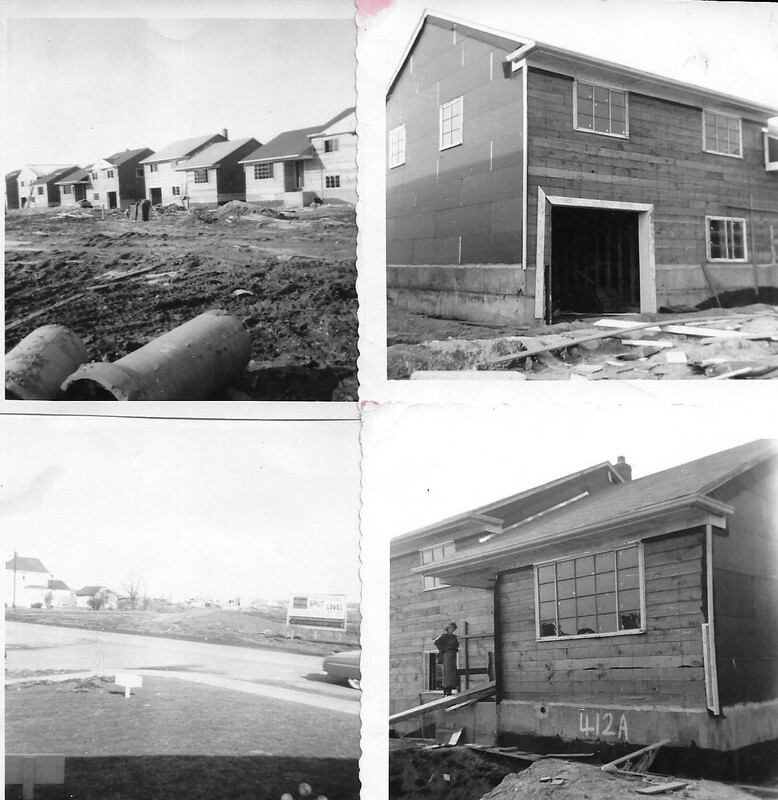 They had made the jump to Long Island just a short time ago when they purchased a home in one of the new suburban communities called Levittown on the “Island”. We Began our house hunting based in nearness to city. First town was Jamaica. Real Estate prices were too high. Next choice was Hempstead. A little house there was still beyond our reach. 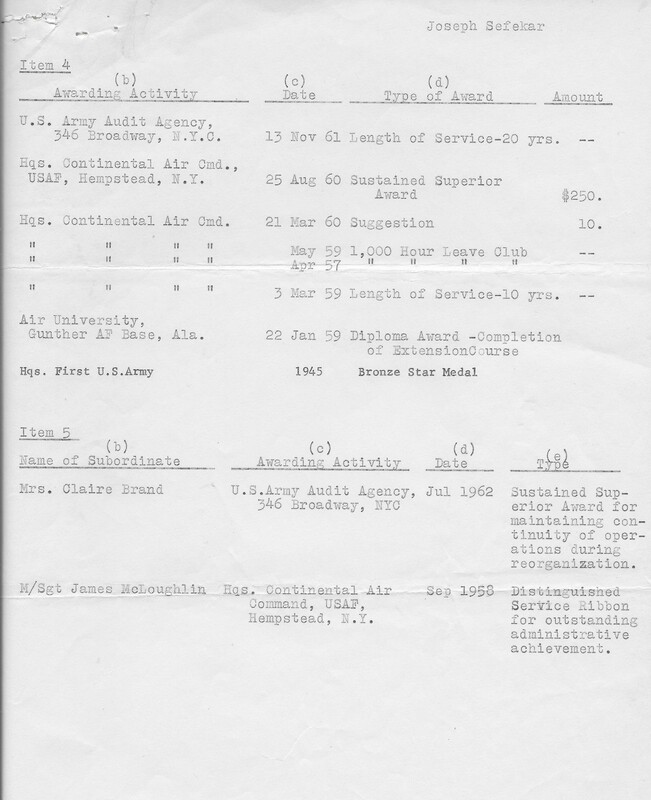 My starting salary with the U.S. Gov’t was $ 1,400 – General Schedule (GS-2) by 1948 (with an intervening war) my salary was $ 6,000 (GS-5). The farther we found ourselves from the city, the cost became more reasonable for us. Our cousin Dave and Jerri Kules purchased in a development several blocks away for $18,000 they got a brick house. When the real estate agent calculated the monthly cost – it seemed doable. I asked him what about telephone and monthly commuting costs on the Long Island RR. He said that’s not considered essential. Having made the decision to move to the burbs was quite an adjustment. “Happy Homeowner” was something that didn’t come naturally, it took a lot of hard work just like a marriage. We made a lot of nice friends and our neighbors were terrific it was an idyllic time. 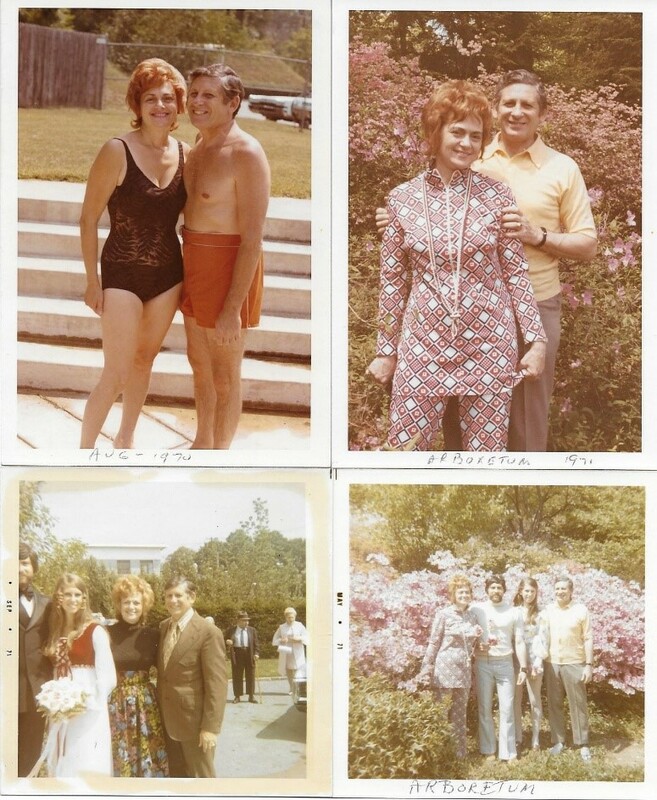 Our next-door neighbors Emily and Len Levine were very special. Thelma made some very close friends that followed her throughout the rest of her life. 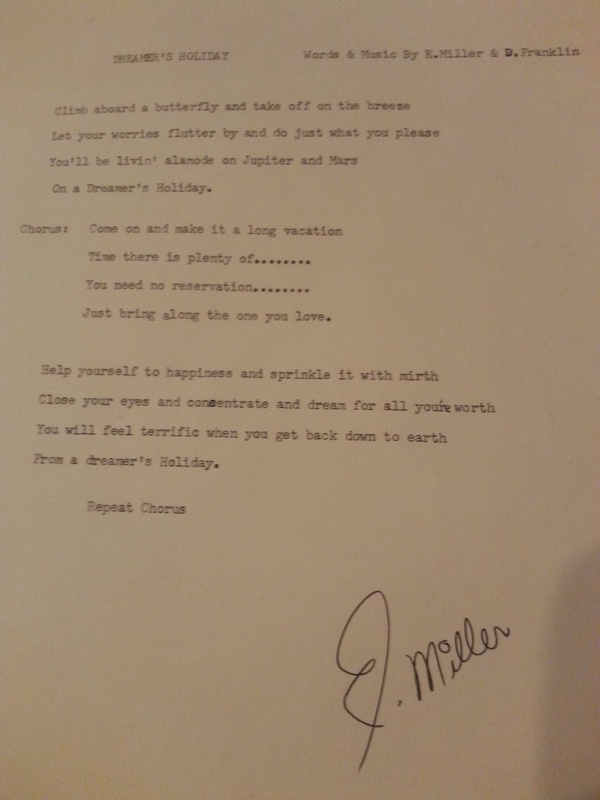 As we found out later when we settled in our new home as I said with our full complement of family. We found out that was the natural progression. It turned out that most our neighbors had two children and predominantly the boy was the oldest followed by a daughter. Of the 12 families 6 on our side and 6 across the street, six families had two children a piece with the boy being the oldest. Then another set of 2 children with the daughter being the oldest. For the remaining five families, there were three sets of two children with two sets of boys and one set of girls and there were two families that had three boys each. 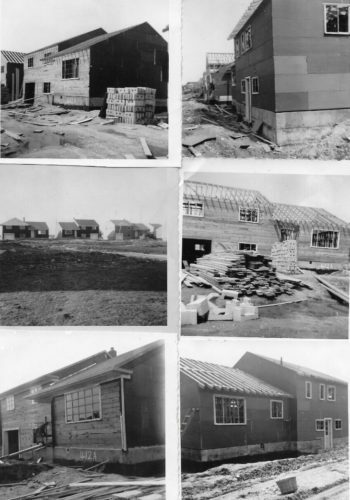 It was an exciting time no doubt with finding a new development which as I mentioned was called Country Village on the borderline between Hicksville and Syosset. We made our decision for the lot and all the fun things that go with selecting the different choices for kitchen and furnishings that come with its construction. 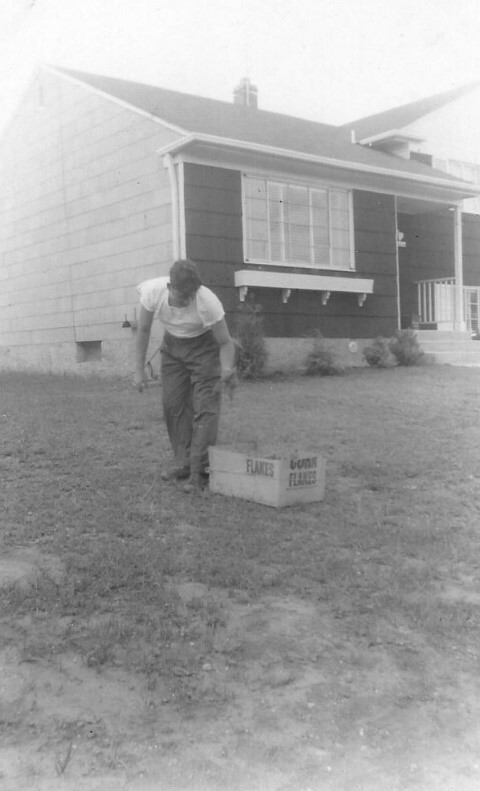 We moved in March 1953 and were very happy in this lovely ‘bedroom community” until my promotion and transfer to Washington DC in October 1965; 12 ½ years later. There was so much to do, it was all so new with these kind of things. Picking out bedroom furniture for my wife and I, creating appropriate bedroom furnishings for my seven-year-old boy and a two-year-old little girl. That it was a fun time and we enjoyed it thoroughly we made so many wonderful friends that stayed with us throughout our lives. Our next-door neighbors were truly best neighbors, Emily and Len Levine and their two children Donnie and Melanie were so nice and we thoroughly enjoyed their company. This is not to say that we weren’t very blessed with other neighbors across the street and nearby. Our children made friends very easily and they also established bonds to last a lifetime. Billy could be found playing stickball or football in the streets Bonnie made friends with three girls across the street Laurie Becker, Ilene Karph and Marilyn Geller were among her closest friends during the impressionable times. As the years progressed I managed to upgrade the 1951 green Chevy to a used 1960 red and white Oldsmobile 88, in 1964 that we purchased from my good friend Irv bagatelle. 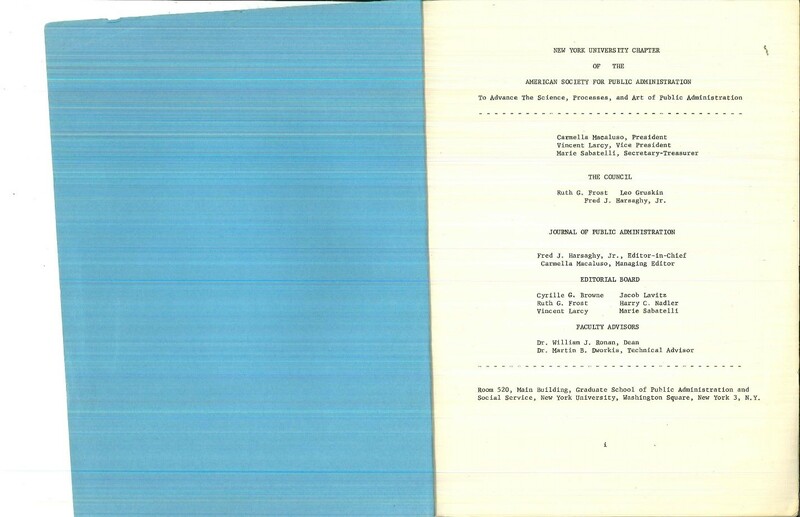 Meanwhile, I was very busy continuing on my graduate program at New York University (NYU). In addition to my work load, my family load and my keeping busy with Midway Jewish Center I had my hands full. But things seemed to fall into place. 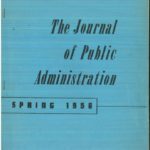 I would complete my dissertation on Manpower Administration which was published in the American Public Administration Quarterly and graduated in 1956. It was a great time and I became the 1st family member to obtain a graduate degree (reference Manpower Thesis and graduation picture**). One of the highlights of the adjustment period was the link to our families. Guess the umbilical cord was severed but we made every effort to visit our families and mine and my wife’s brothers and sisters. At least once a month we would travel into Brooklyn to be with mom and pop and my mother’s mother. It was always wonderful gathering with our brothers and sisters and their families to get together for whatever occasion holiday or just to visit. On one such visit in 1953 we were delayed in our travels by what appeared to be a funeral procession Brooklyn on Sunday afternoon. I realized that this was the funeral procession of what was determined to be two traitors, Julius and Ethel Rosenberg accused and convicted of giving secrets to the Russians for the building of an atomic bomb. It was a sad day especially for members of the Jewish community and myself. Being such a staunch believer in the values of the American democratic system and a lover of this country to have this befall as a black mark for our devoted brethren to our homeland was a tough pill to swallow. We have in in our Judaic culture a Yiddish expression that captures this sentiment “it was a Shanda”, SHANDA: A shame, a scandal. The expression “a Shanda fur die goy” means to do something embarrassing to Jews where non-Jews can observe it. I tried to explain the basic undercurrents to my 7-year-old son of what was happening, as the funeral procession slowly passed by and we proceeded on our way to spend the day with our family. These are incidents that can shape even the littlest of minds. My worries were unfounded as my son grew with similar traits. A staunch supporter of our democratic government, working in national state and local elections. He is also patriotic, community oriented, flies American flags and buys only American cars, like his Dad. 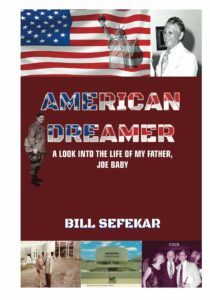 The Syosset years were filled with fulfilling the American dream; coming into my own and seeing my family develop and flourish. 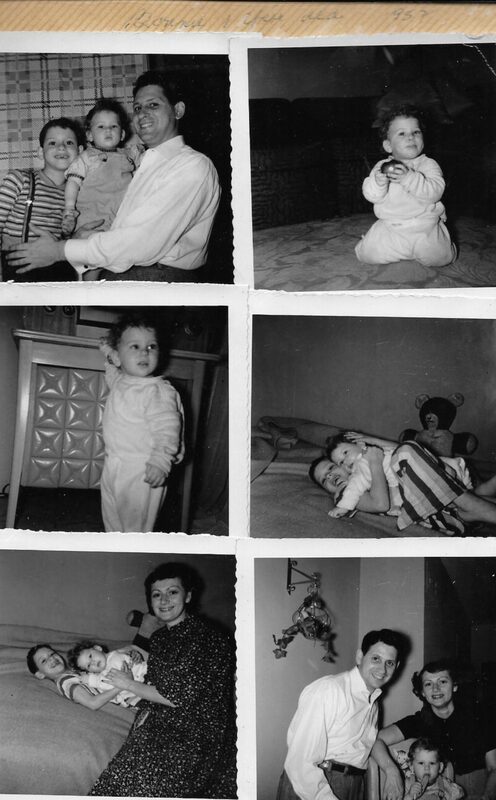 My daughter Bonnie Lynn was two years old when we moved to Syosset. She was always so cute and precious and we loved her dearly. Billy on the other hand was perfecting to become his nonstop, rambunctious self, always seeming to find something to get his hands into. Thelma was always making sure the house would be very presentable. 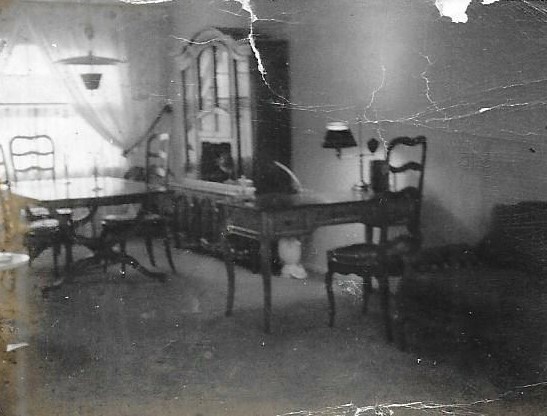 We were able to purchase new furniture among which we still have is the Thomasville dining set with even an armoire. 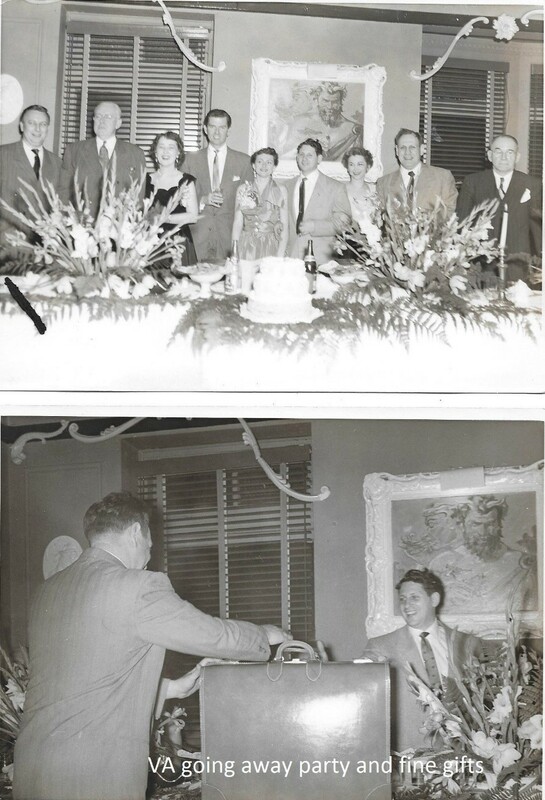 Hundreds and hundreds of great dinners and family gatherings proceeded us from Syosset, Maryland and then to Palm Harbor, Florida. I became very active in the Temple or synagogue as we say. The Midway Jewish Center was a project with great vision for the influx of Jews that were migrating from the second Jerusalem, New York City. 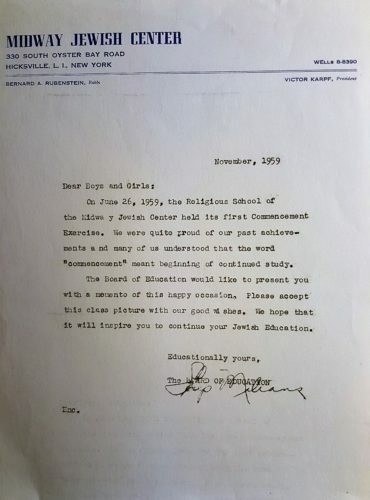 Prior to the formation and construction of Midway Jewish Center the fledgling Jewish population in keeping with the high holidays; celebrating of the Jewish new year Rosh Hashanah and Yom Kippur wasted little time in arranging to use the property on the corner of S. Oyster Bay Rd./Plainview Road. In addition to leasing this property for the holiday services they also secured a very large tent that held over 200 people. This tent lent itself to the impression of being little part of the desert, flat and sandy as the surrounding land for the shopping center that was going to be built the “Plainview Shopping Center” was being prepared for development. It made quite an impression as here we were in our new surroundings that symbolized what must been like for the Israelites to be in the desert and convening the great assembly with the high priests prevailing. The founding fathers of Midway Jewish Center had the foresight to purchase a nice piece of property that was very close to our home, adjacent to Country Village development where we moved to. The land that was purchased was part of the bigger parcel that was sold to make for our development and adjacent developments was a potato farm. I can still remember my son being in Hog Heaven, pardon the reference with all the mounds of dirt and everything else that was part of the property. What made this so attractive was that the barn became our first sanctuary and the farmer’s brick house was very adaptable for housing administrative offices for the Rabbi, the Cantor and the Hebrew school. This became a focal point for a family’s spiritual needs during our stay in Syosset. I didn’t however, relinquish entirely my responsibilities for overseeing the lawn and landscape. As a harbinger of spring I would oversee my estate make an assessment of what was needed to be done and faithfully traipse over to our next-door neighbor, Len to share with him, what he also needed to do. He would dutifully tell his wife Emily that Joe came over and we need to get started on fertilizing, seeding and pruning. Life in suburbia had many amenities and in our newfound little neighborhood a wonderful set of new friends that we were very comfortable in socializing with. There were plenty of opportunities for picnicking at parks in the area as part of the various community events and activities. Our next-door neighbor’s. Emily and Lenny Levine very close friends of our neighbors on the other side the house, Irwin and Helen Bloomfield. Across the street were Irene and Abe Becker. They had a daughter Laurie who became a lifelong friend with my daughter Bonnie and still visit regularly after these many years. They also had a son, Paul, who was a year younger than my son Billy. An incident occurred a couple years after we moved to Lincrest Street that had a significant impact on how fragile we all know life is. What occurred was a deadly fire that raced through a warehouse office building in Manhattan. There was a hero who paid a dear price for making sure that lives were saved while his own was in peril. Abe Becker who owned the company on the floor above where the fire broke out managed to save a number of lives but still felt it necessary to make one more entry into the burning flames to make sure everyone was out. Unfortunately, Mr. Becker, the brave person that he was, was unable to find his way out to safety. It was a tragic end to a very fine young man, a loving husband and father. In spite of these tragic developments I can dutifully report that Irene remarried and the two children Laurie and Paul grew up to become very accomplished, successful and caring citizens with families of their own. Life goes on and we regroup through the adversities. Next few years would bring a number of changes in career fortunes; the growth of my family and dealing with the normal exigencies that were faced. 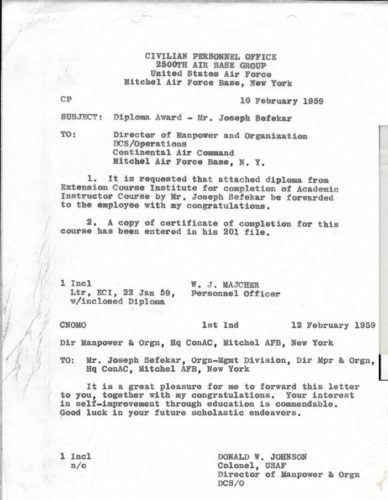 I inched closer to obtaining my Master’s degree and has high was finishing my dissertation which dealt with at Mitchell Air Force Base and the strategic air command. We embraced the lifestyle afforded us in Syosset and on Long Island that unfolded throughout this chapter and into the next. HE WROTE IT, THEY DID IT, HE SAVED; TRANSFORMING AMERICA!! 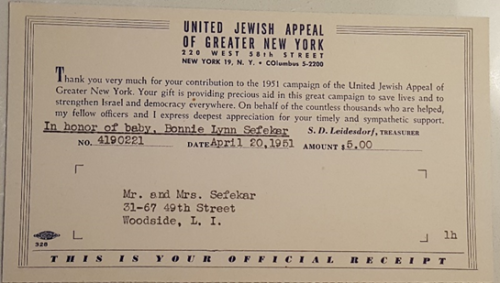 Gift to the United Jewish Appeal honor of Bonnie Lynn Sefekar’s Birth. It was so wonderful finally we’d have our full complement for our family. 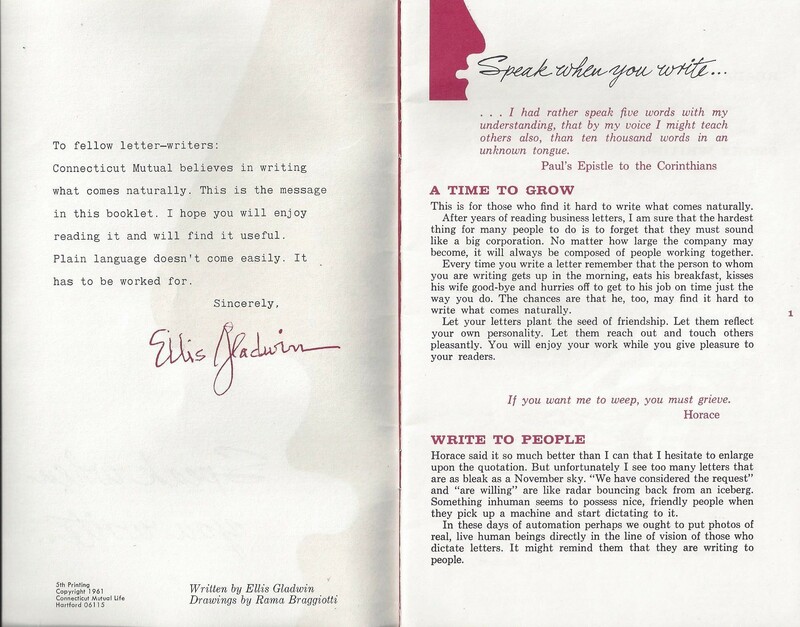 In keeping with my lifelong obsession of writing letters to the press, too friends and myself. There was a regular feature in the New York Sunday News: Ask Anybody! 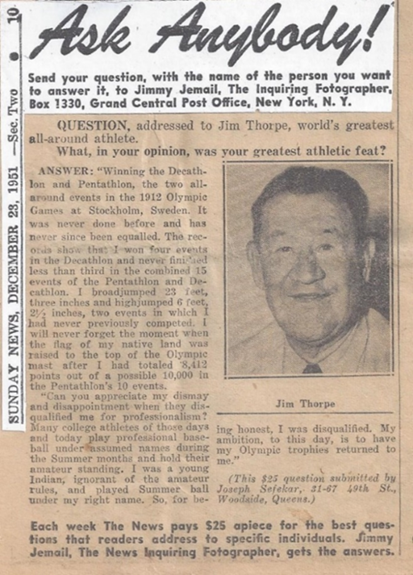 So my Question, addressed to: Jim Thorpe, world’s greatest all-around athlete. “What, in your opinion, was your greatest athletic feat?” It netted me 25 cool ones a nice tidy sum in those days and a far cry from 15 years ago. In 1935 on my first submissions into the wacky world of “newspaper letters” when I received $1 or $2 for each entry. It was a great going away party and a lot of camaraderie showed through. This would be the first of many Thank You’s and Godspeed as I moved up the ladder with Thelma. From the VA I received a number of accolades and a large leather piece of luggage. Considering I was headed to the Maritime administration the idea of us taking an ocean cruise seemed like a distinct possibility. Actually this wouldn’t happen for another 30 years. 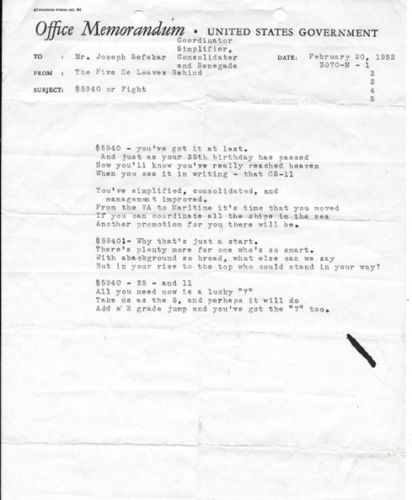 My work with the Veterans Administration, Brooklyn regional office resulted in the promotion to the Maritime Administration, (MA) on March 7, 1952 there was a going away party for me with some very catchy phrases. Like VA calling the Maritime and all the ships at sea! Sweepers! Man Your brooms! Clean Sweep Fore & Aft! 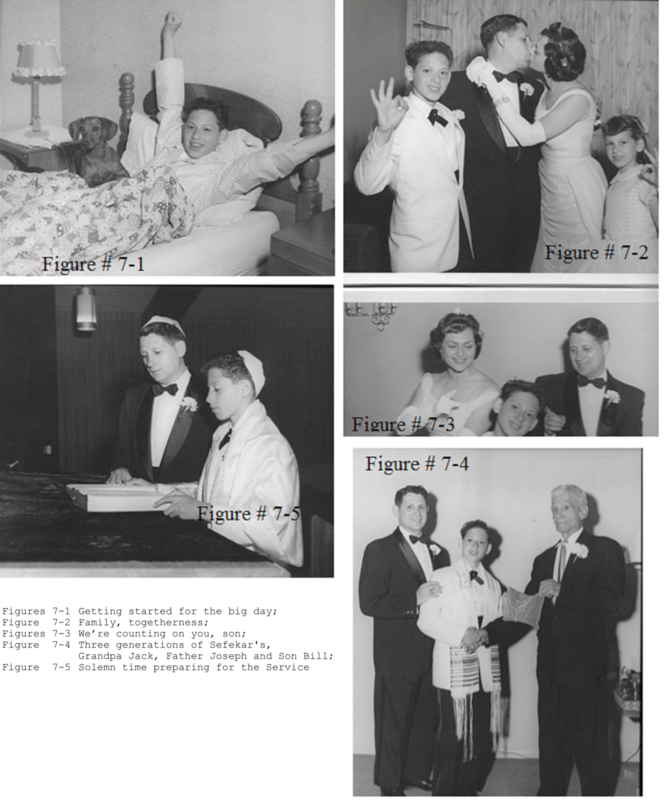 The picture on the left is of Thelma and me planning to head out for the Prom when I graduated from Long Island University (LIU) with my undergraduate Degree. The picture taken in June of 1950 could actually be mistaken for a high school prom picture; boy, did we look younger then. 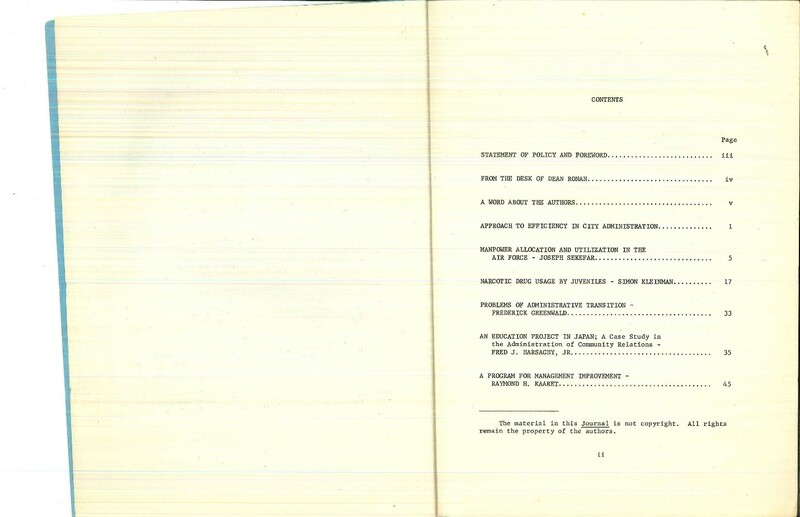 One of the most memorable and important assignments took place under the Maritime administration. 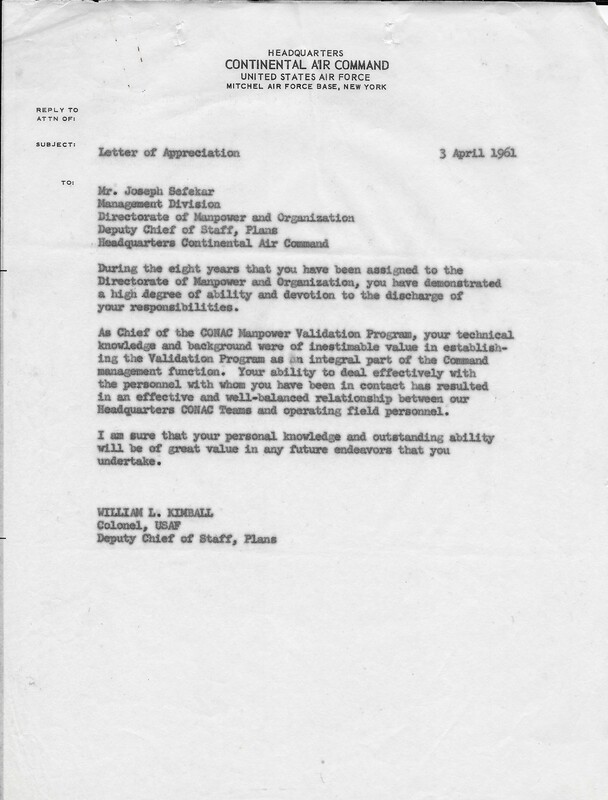 During this period between 1951 in 1952 I was involved with preparations for the building and commission of the S.S. United States, ha ha. This magnificent ship which would become the Flagship for the SS Ocean Liners was completed on June 19, 1952. It was a great day of celebration and I was so fortunate and my wife and children attend the “christening” of the SS United States. 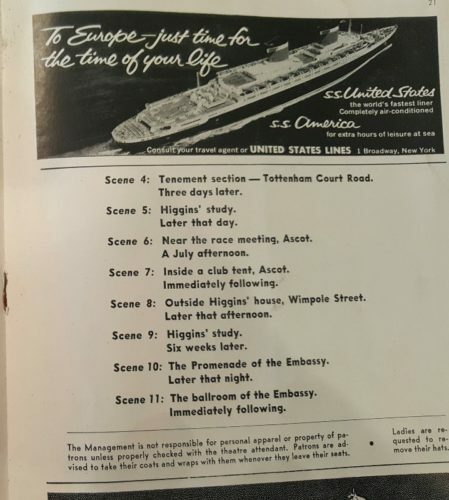 It was a few years later that an advertisement appeared in the playbill Thelma and I attended for my fair Lady that showed the advertisement for the USS United States cruise liner. It was an exceptional assignment and part of this, the fastest cruise ship of its time. And completely air-conditioned no less. My son was especially enthralled as he tried to get a complete rendering of the largest ship of its time. It fared better than the Titanic, which coincidentally Billy learned the words to, “They built a ship Titanic and when it was through…” One of his first attempts at “professional” entertainment. Remembering all the nice little things that came with being a father for the first time. Little Billy was a handful, he was so energetic and got into trouble all the time it took the two of us, Thelma and me to keep him under control. I can only imagine what it must be like to raise children with a single parent particularly a single mom. I really give them all the credit in the world. But back to my little tyke. He was constantly running and falling and getting sick. At least when he was five and had his tonsils out he started a normal routine not sickly and put on weight. One of the instances of many that I recall with endearment was when Billy would watch me get up every morning as I shaved, got dressed and made breakfast. He would watch intently as I prepared my coffee and breakfast cereal. As he watched he grabbed a cup to join me. Because he was only four or five at the time, it wasn’t good idea to give him coffee with the caffeine. He was wild enough without that. What I did was I left a little coffee at the bottom of the cup and added a third of a cup of milk. Ironically my son never required a taste for coffee when he became an adult but stayed with hot chocolate and tea until he was much older and realized the need for the caffeine. 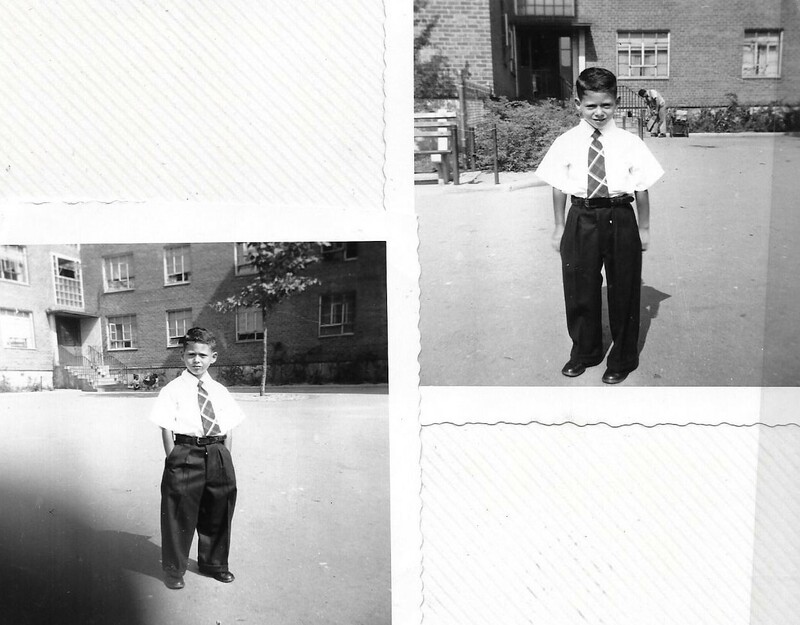 Another lesson that was passed down during this early time was that I wore a tie to work as part of my regular attire. In keeping with his attentiveness I would show him the art of making a single and double Windsor knots. This put him in good stead his whole adult life and as it turned out 60 years later turnaround is fair play and he helps me make my tie knots look very nice. 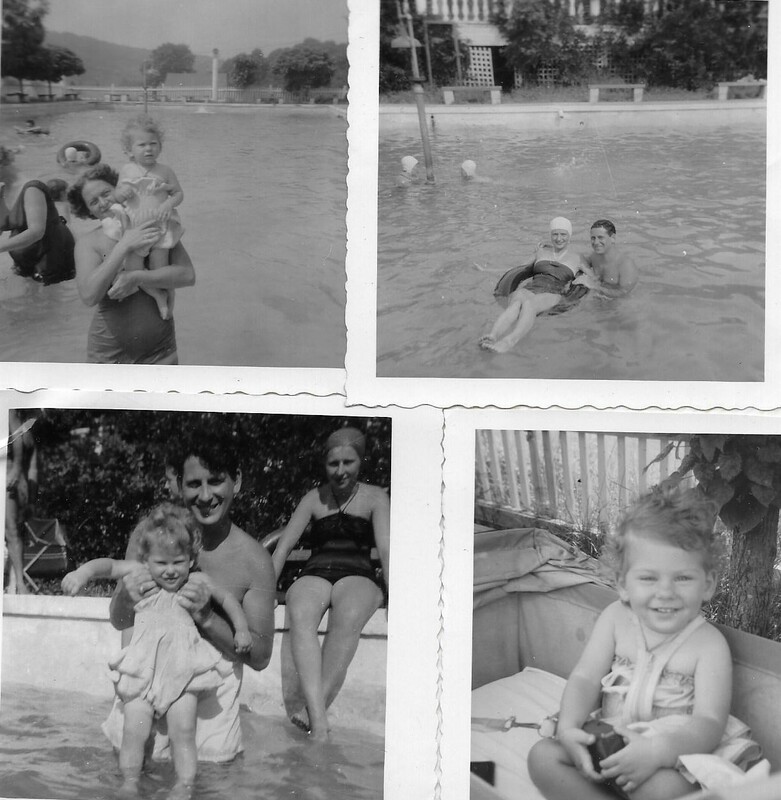 These were many memorable moments with my son Bill and then 5 years later my wife was pregnant again with our second child Bonnie Lynn. bundle of joy was delivered uneventful. Bonnie Lynn came into the world and a shining example of what a little Princess should be. Very cute and adorable and could do nothing wrong. We did find out later on the number of occasions that we administered disciplinary measures to the wrong party as my son always looked like the culprit while my daughter Bonnie sat with a smile very innocently while she kicked him again under the table. Have so many precious memories during this time as part of life cycle, it is so endearing to newly married couples when they embark on a life together and starting a family. My wife Thelma although completely consumed with raising our two children still found a little time to do some things not just with her family and newfound friends but things that she enjoyed throughout her life. She loved to sing along with the latest hits on the radio that she used to follow. 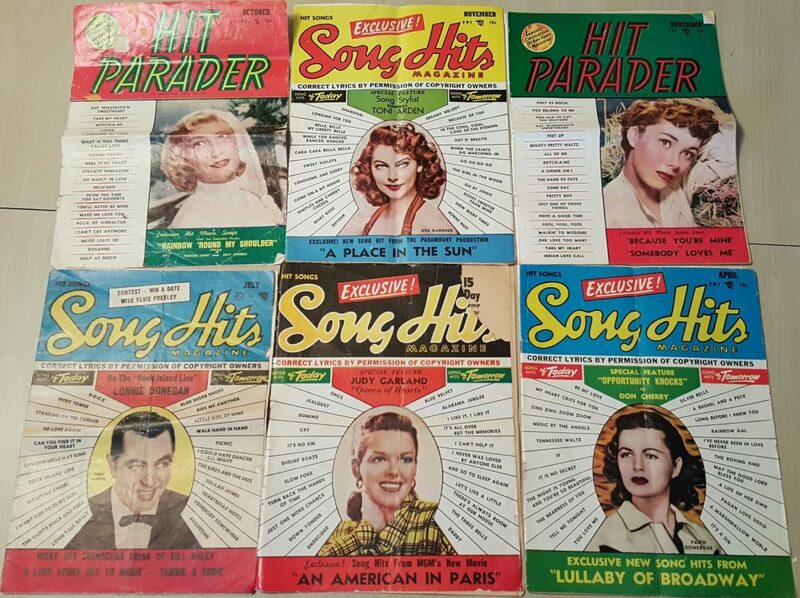 We had a whole collection of hit Paraders and Song Hits and sheet music from the early 50s. I have always kept track of songs, artists and wrote down many of the hit songs and words that I grew up with and so did Thelma. Looking back there were plenty of these songs we reminisce about and are still considered classics even today. Such favorites we’d hum along with the tune were: Unforgettable; Kisses Sweeter Than Wine; Because of You, Come On-A House, The Nearness of You, Silver Bells; Be My Love; Blue Velvet; It’s All in the Game and many, many more. As I mentioned early on I was always enamored with words, songs and song writers and had an opportunity to meet Mr. Miller who wrote Dreamer’s Holiday. It is a fitting time in our lives and still being idealistic, just starting out and very happy with our lot in life. It was at this time the opportunity presented itself for a life-changing decision to leave the confines of Queens, New York and move to the outskirts of civilization; Hicksville, New York. 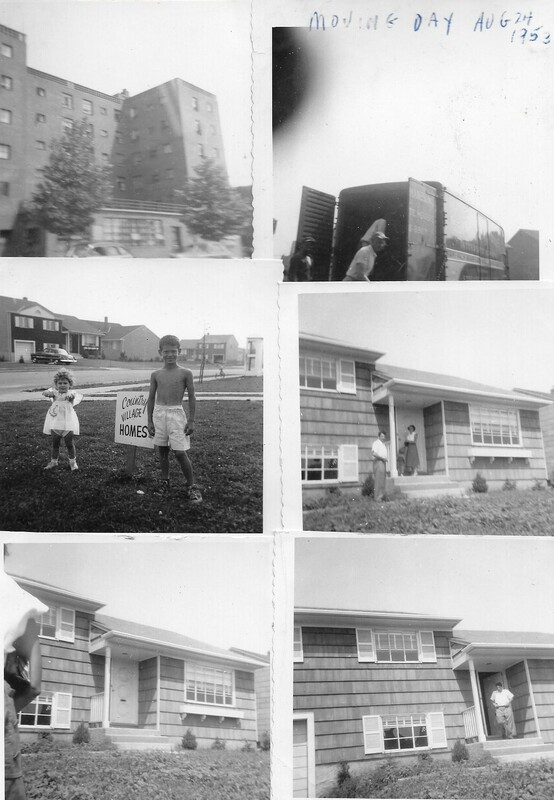 Hicksville would become indigenous to Syosset, Long Island which is how we presented our residence. It seemed to present more of a favorable ring as opposed to being from “Hicksville”. In considering the move to the ‘burbs we looked to our friends again Irv and Lee Bagatelle. The Bagatelle’s had a ready cut the umbilical cord and moved to this new concept in the suburbs; Levittown. We liked what we saw and Thelma began the financial preparation to secure a loan from her mother Bessie Abrahamson. The development that we settled on was called Country Village. It seemed like we drove forever on Northern State Parkway to exit 42 S. Oyster Bay Road hardly any landmarks were there for us. 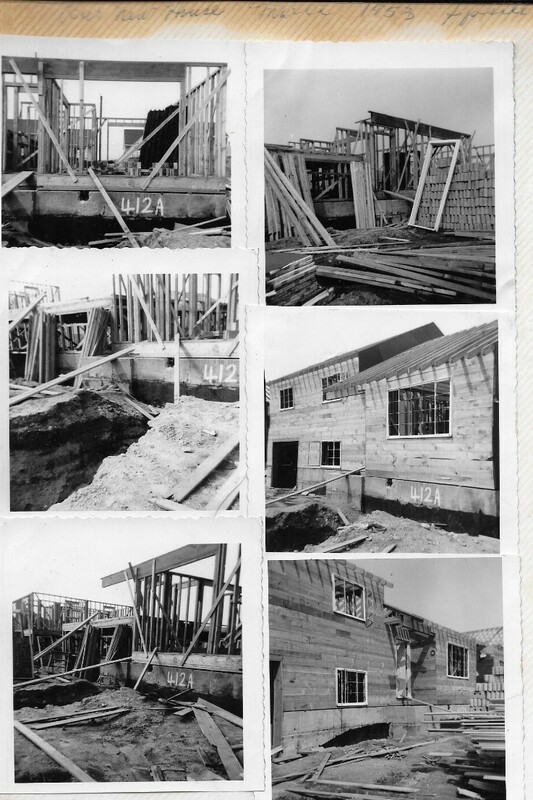 This was one of the first developments to be built in this part of Nassau County on Long Island. It’s amazing in just a few short years what sprung up shopping centers, schools even our place of prayer, Midway Jewish Center. 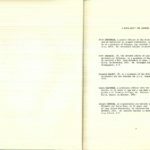 NB ** denotes Material that will be in the book published at a later date.